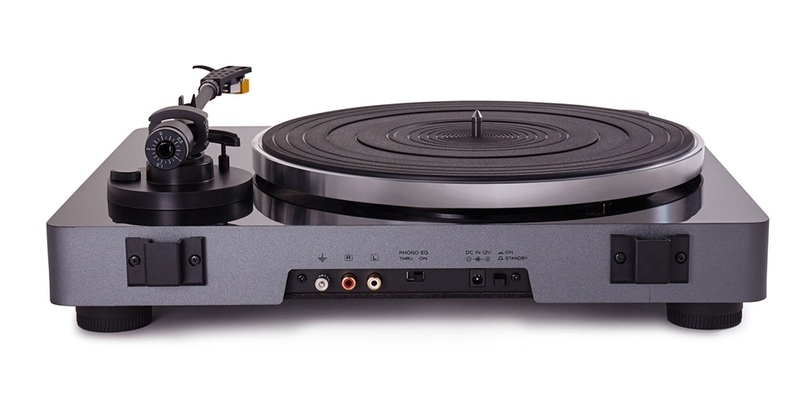 With the end of the year approaching, we decided to do our round-up of new record players that came out in 2018 ranging from entry-level decks to audiophile-grade options, but keeping the budget under the $1,500 price point. 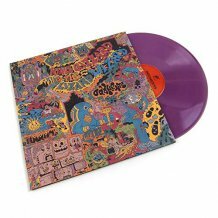 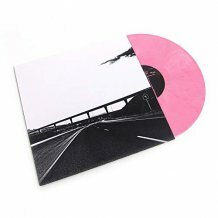 Since the early 2010s, when vinyl started to make its comeback, there has been a constant growth in the number of new releases, reissues, vinyl subscription services, record stores, pressing plants, and overall interest towards vinyl culture. 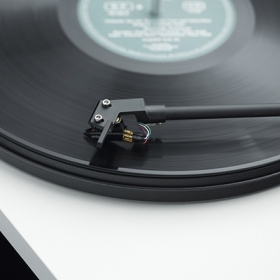 Along with this, audio companies and equipment manufacturers have been regularly coming out with new products and accessories to keep up with the trends. 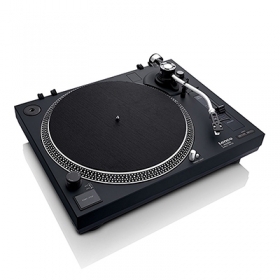 Some equipped with the latest tech and some featuring only the bare essentials. 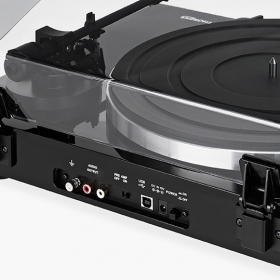 And while there is still a large number of sub-par turntables and cheap all-in one systems hitting the market, every year there are a handful of turntables that are worth the money and make a good investment. 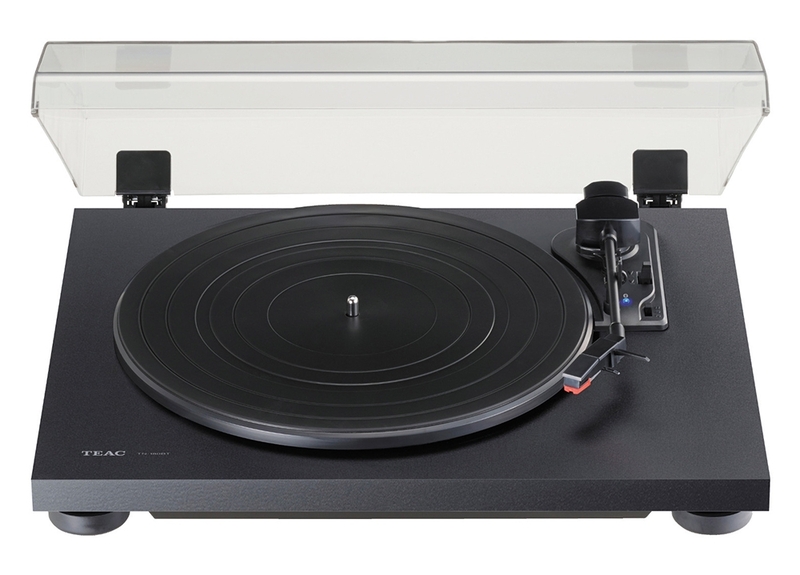 So whether you're looking to buy your first turntable or replacing an old one, here's a list of decks from 2018 you should consider. 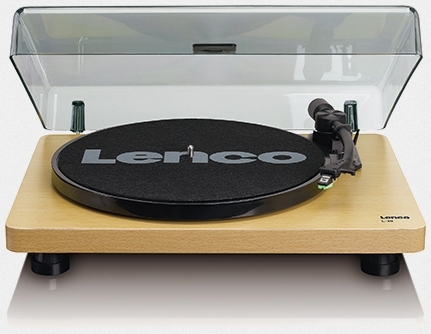 The L-30 is the latest low-budget record player released by Swiss electronics company Lenco. 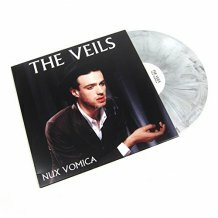 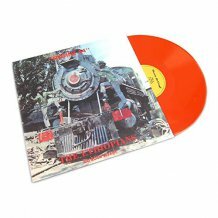 Aimed at newcomers starting to explore vinyl, it can be a perfect starter kit for young music enthusiasts who like to play around with their parent's more expensive equipment. It's a semi-automatic (auto-stop) belt-drive turntable with an appealing minimalist design, pretty much ready to play straight out of the box. 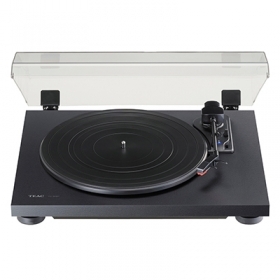 It features a built-in phono preamp with RCA line output so you can plug the deck straight into an amplifier or active speakers, and also has a USB port which allows you to connect it to a computer and digitize your vinyl. 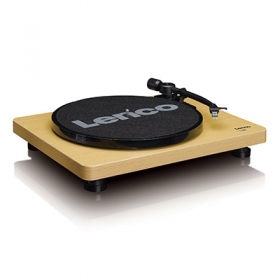 It comes with a full size 300mm aluminum platter, a factory fitted Lenco moving magnet cartridge and a removable plastic dust cover. 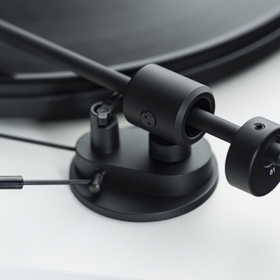 The tonearm has a counterweight, but it's not adjustable, so you'll be able to change the cartridge only with one of the same tracking force as the original (Lenco N-20). 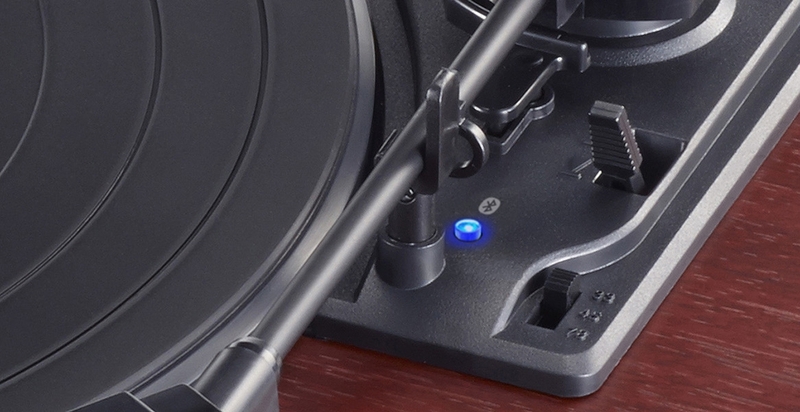 At the base of the tonearm there is a cue lever and a speed switch, which allows you to play records at both 33 RPM and 45 RPM. 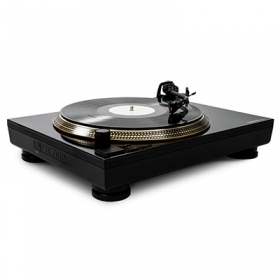 The MDF plinth has a contemporary wooden finish and is available in two colors - black and wood. 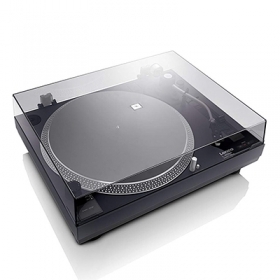 Beside the turntable, the box also contains an AC power adapter and an RCA cable. 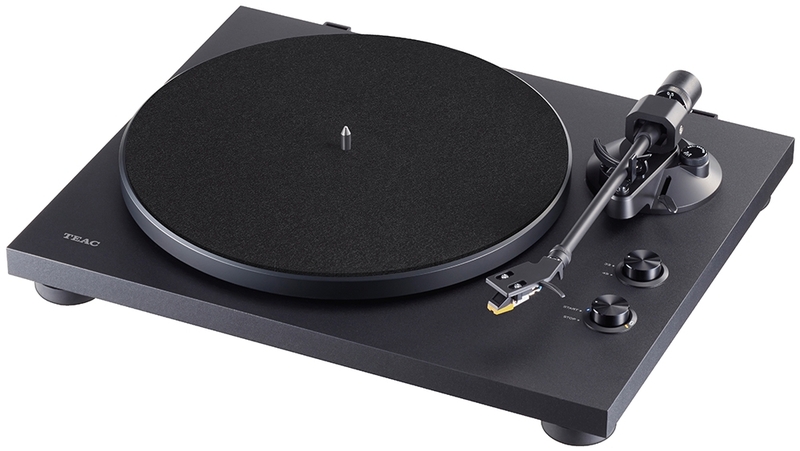 The Primary E is the most affordable entry-level turntable of the Vienna-based audio specialist Pro-Ject Audio Systems, and is essentially a slightly updated, less expensive version of the original Pro-Ject Primary (launched in 2016). 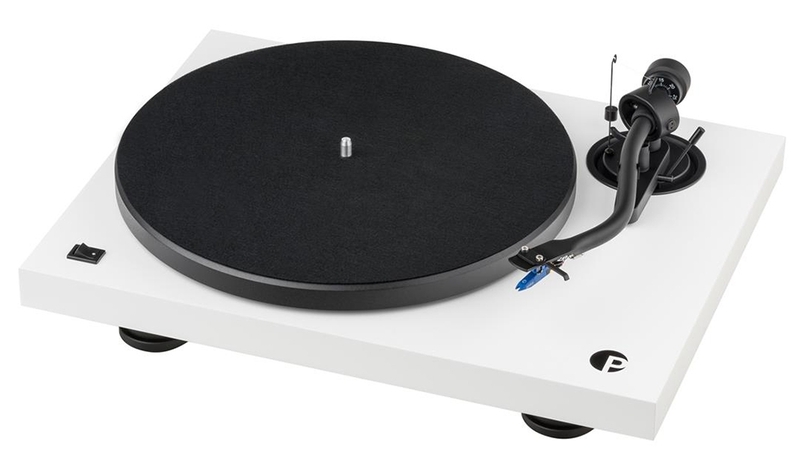 Like it's predecessor, the new Primary E takes its overall design inspiration from a merging of Pro-Jects Elemental and Essential II turntable designs, offering traditional aesthetics and high-quality performance. 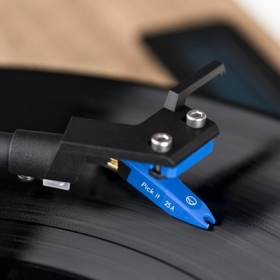 It uses the same lightweight and low friction 8.6” aluminum tonearm as the Elemental, with sapphire bearings for optimal tracking, and it's specially engineered to perfectly match the mounted Ortofon OM series cartridge. 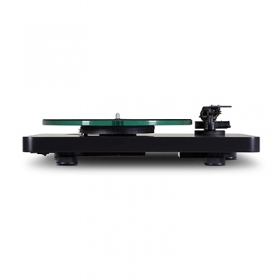 The pre-adjusted anti-skate and tracking force, enables an effortless set-up and a near-plug-and-play solution. All you need to do is manually position the silicon belt around one of motor pulleys, depending on whether you're playing a 33 or 45 RPM record. 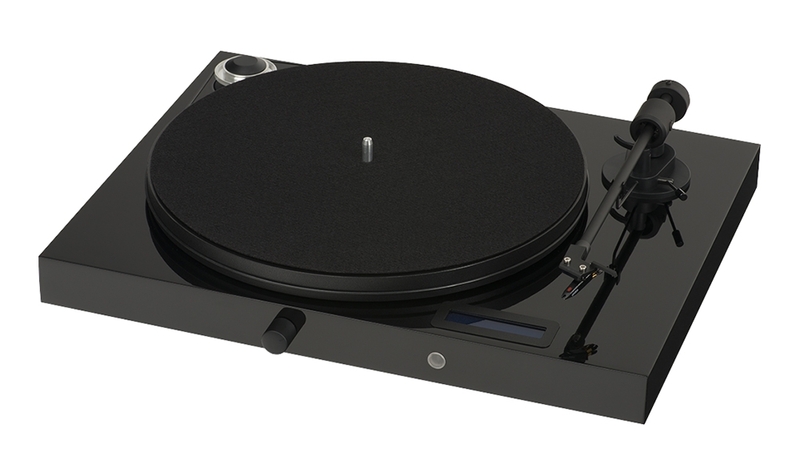 Unlike the original Primary, the E model uses a built-in 230V motor which is is direct-fed to the mains. 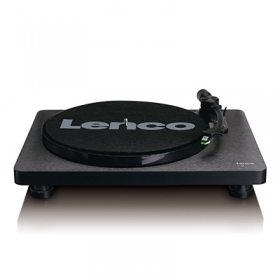 This eliminates the need for internal signal processing and an external wall-wart power supply, but retains a quiet, stable motor rotation. 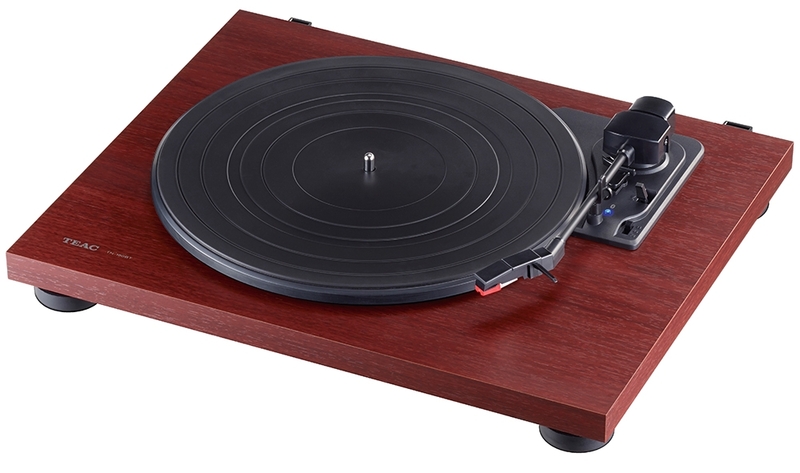 The motor itself powers the same perimeter belt system, driving a 300mm wood platter, topped with an included felt mat. 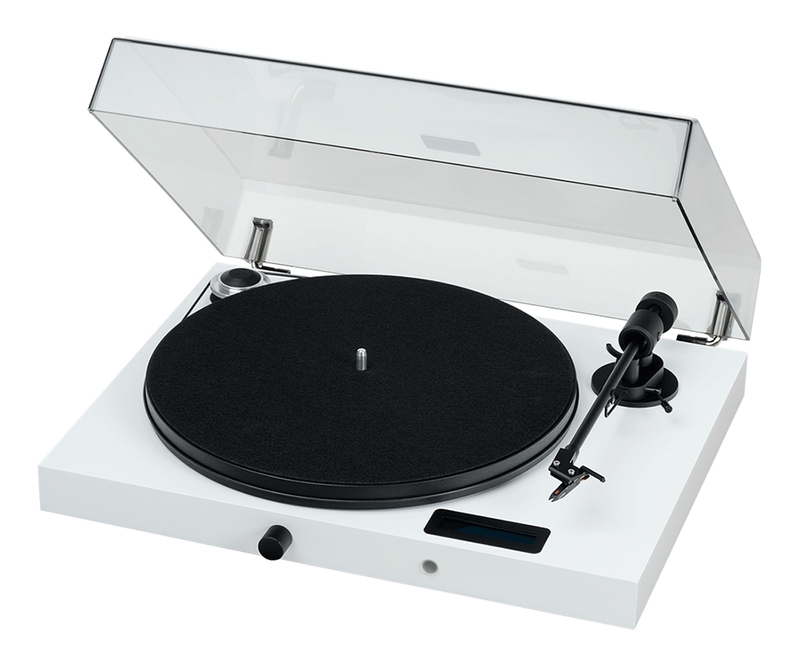 The turntable has a machined, special composite fiber chassis with 3 vibration absorbing feet, a detachable acrylic dust cover with adjustable hinges, and is available in red, white or black finish. 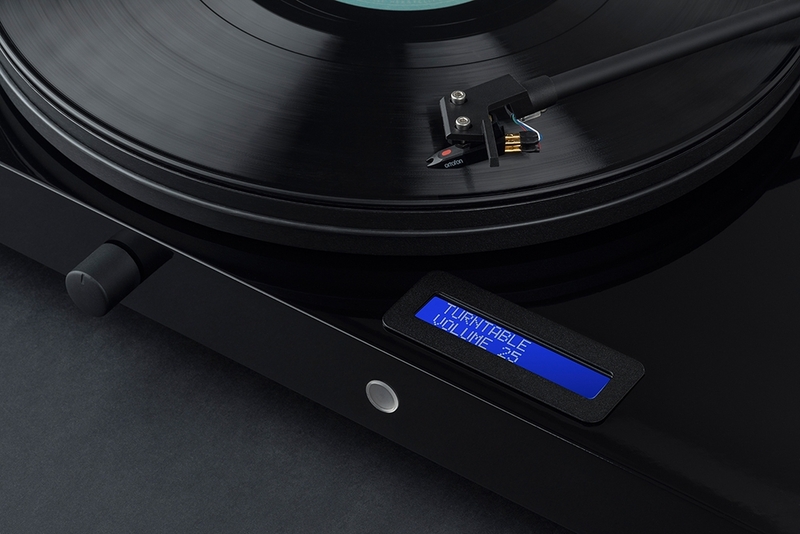 The new Primary E is also available with a built-in MM phono stage, the Primary E Phono, with a switchable phono or line output, so you can use it with an external phono preamp. 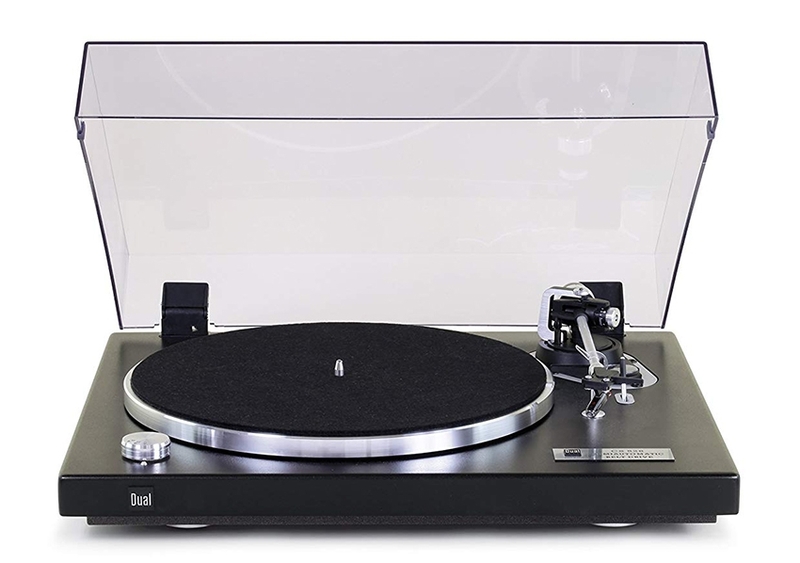 Pioneer & Onkyo Europe GmbH owned Teac brand's new entry-level, semi-automatic belt drive record player with an integrated phono preamp and Bluetooth connectivity. 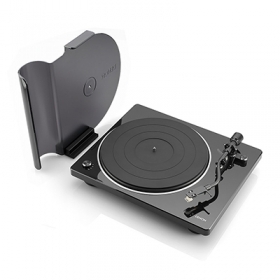 Being a 3-speed turntable, it can play 33, 45 and 78 RPM records, by flicking a small switch on the tonearm base.As previously mentioned, in addition to the conventional Line or Phono output (thanks to the bypassable phono stage), the TN-180BT allows you to wirelessly connect any type of Bluetooth speakers or headphones. 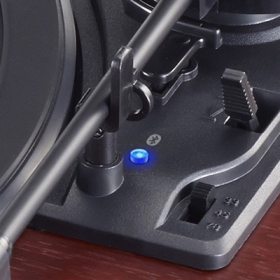 The pairing button is also located at the base of the tonearm, and illuminates in blue when the connection with a device is successful. 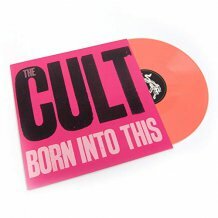 Unfortunately the built-in Bluetooth module uses the SBC codec, so the signal is lossy. 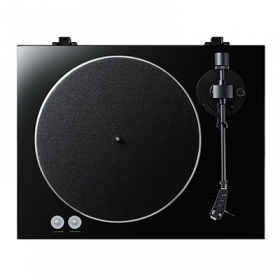 The turntable comes with a balanced straight tonearm with fixed counterweight, a manual arm lifter, and a factory fitted MM cartridge. 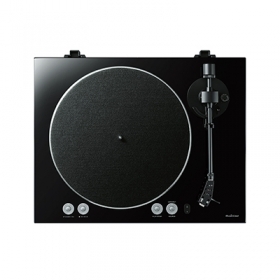 It has an auto-return mechanism so the tonearm automatically returns to the original position after the playback ended. 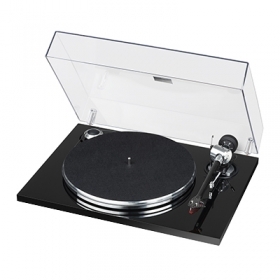 The platter made of plastic is driven by a high torque DC motor, using a precision stainless steel spindle and brass spindle holder. 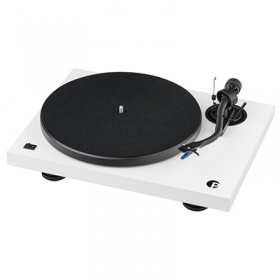 The TN-180BT is housed in a single wooden board cabinet, made of MDF and comes in black, white or cherry finish. 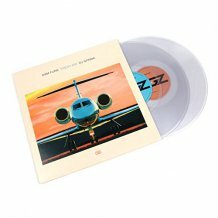 It also comes with a removable acrylic dust cover. 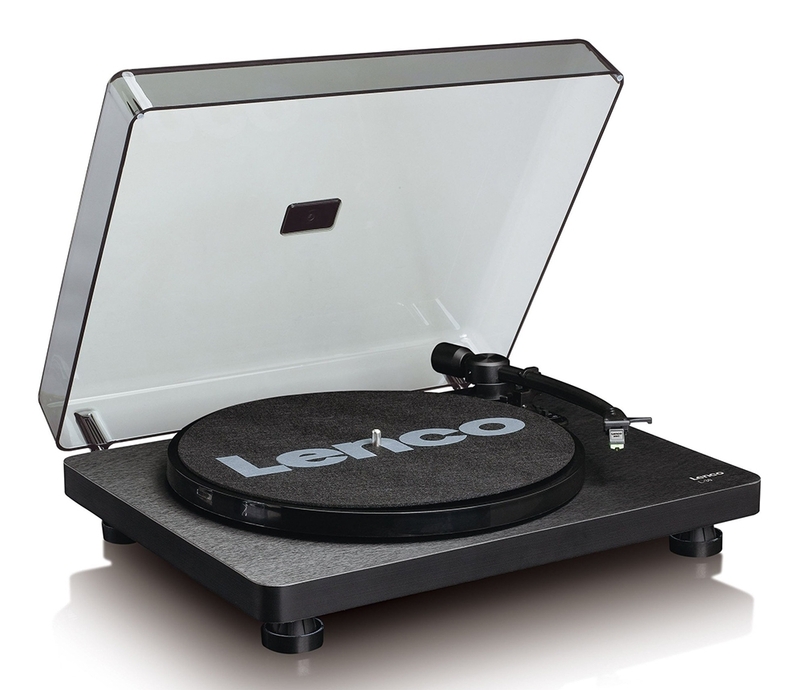 Another entry-level turntable released by Lenco this year, is the direct-drive L-400 model, fitted with a switchable phono pre-amp and a USB digital output. 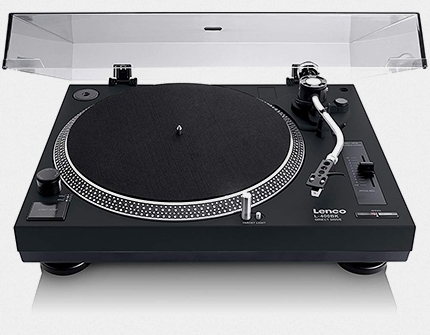 Without too much investigation, we can confirm that this is a black version of the L-3808, released last year, which was available in white and matt grey. 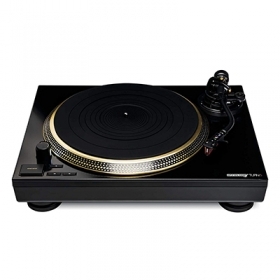 It has a design similar to the classic Technics 1200 or AT-LP120, and packing the same features: strobe light, cue light, pitch control. 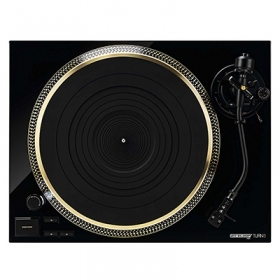 Having these functionalities it can also be considered a budget DJ turntable. 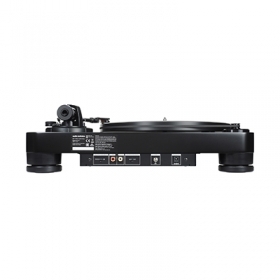 The L-400 comes with an S-shaped tonearm, complete with adjustable counterweight, anti-skate, lockable arm rest and arm lift mechanism, removable headshell, and a pre-mounted Audio Technica cartridge. 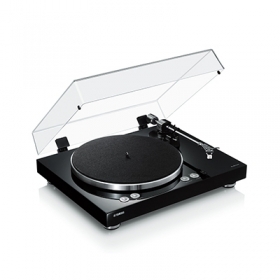 Weighing 5,35 kg, the unit has a plastic construction, with aluminum platter and a clear plastic dust cover. 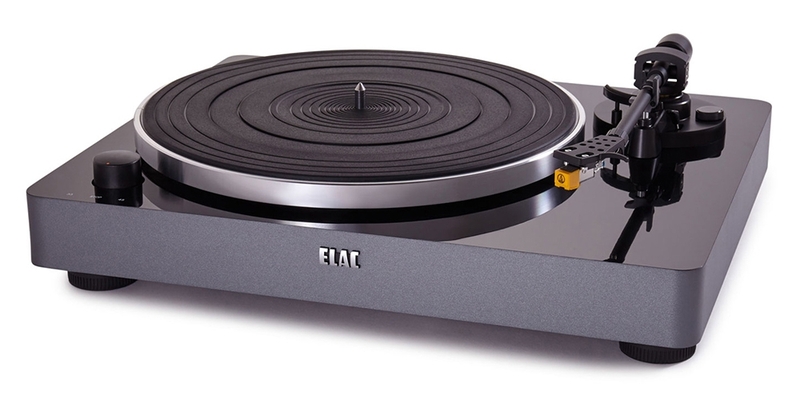 This year along with the TN-180BT, Teac has also released another entry-level, belt-drive record player, the TN-280BT. 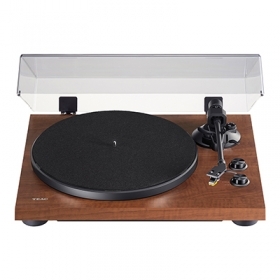 In terms of main components and physical appearance, this is basically a Teac TN-200, but also comes in a walnut finish. 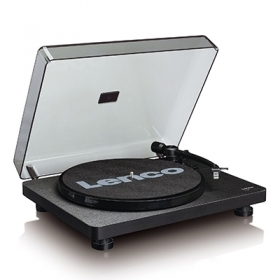 However the main upgrade in functionality is the built-in Bluetooth transmitter. 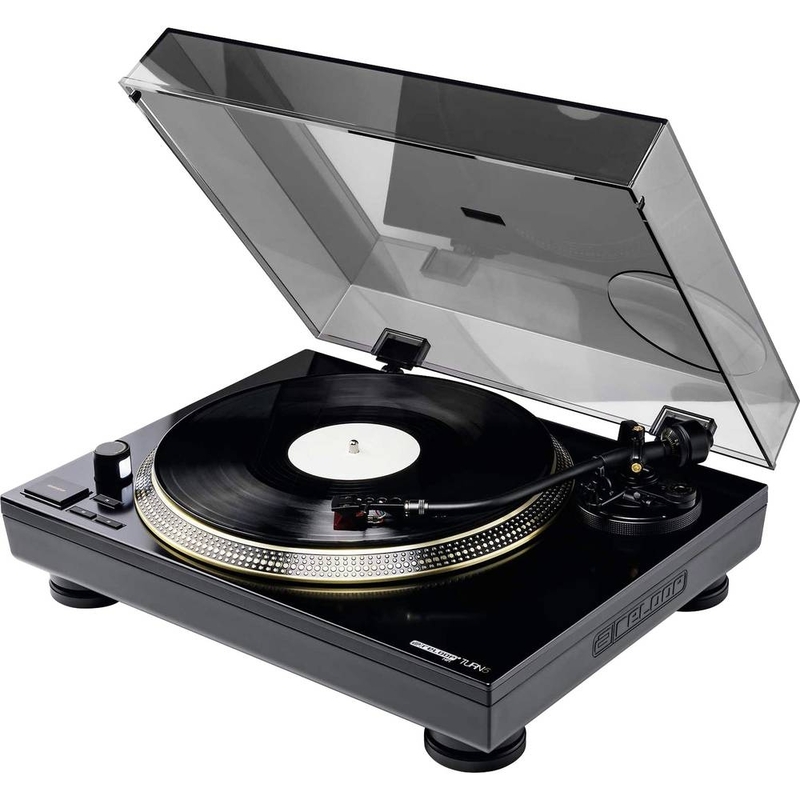 Like the TN-200, the upgraded model has two control dials on the front plate of the MDF plinth, one for speed selection (33/45 RPM), and one for starting and stopping the platter. 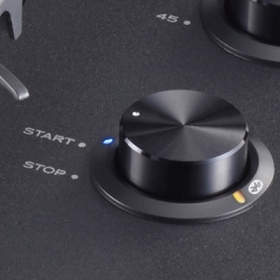 The Bluetooth pairing button is located on the right side of the unit, and pairing indicator near the start/stop dial tells you the speakers/headphone is successfully connected. 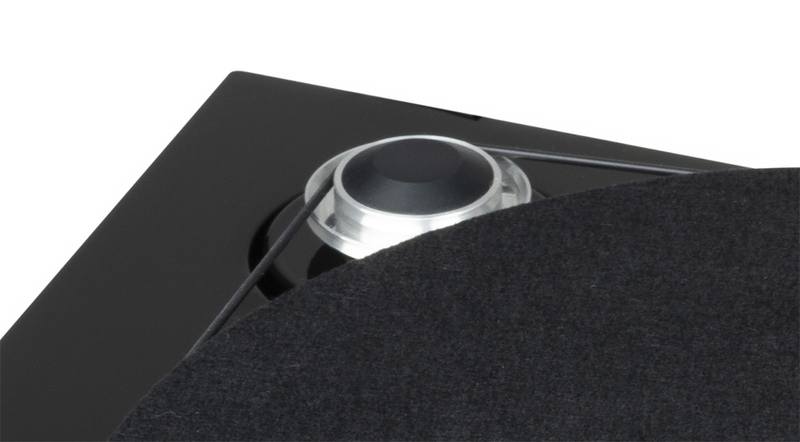 The aluminum die-cast platter, topped by a soft felt mat, is driven by a high torque DC motor. 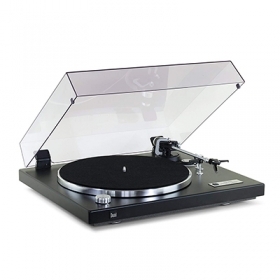 It's accuracy is maintained by a polished stainless steel spindle and durable bronze spindle holder. 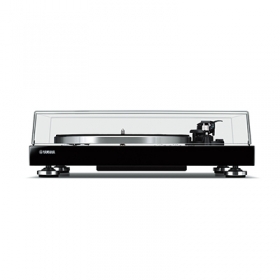 A straight tone-arm with adjustable counterweight and anti-skating mechanism ensures an accurate tracking. 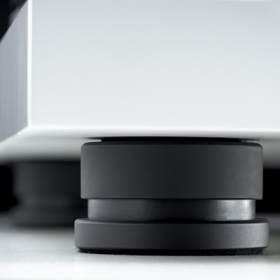 A moving magnet cartridge is also installed at the factory. 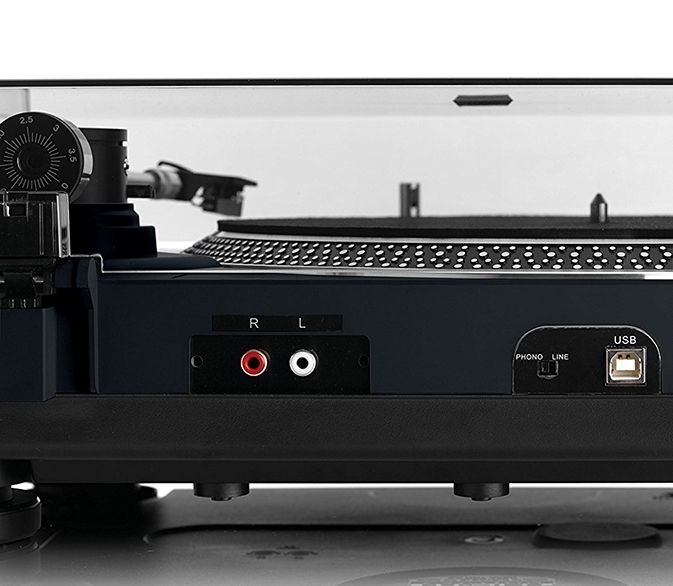 Having a switchable phono preamp the turntable can be connected to any audio system, while the USB port lets you plug the TN-180BT to a computer. 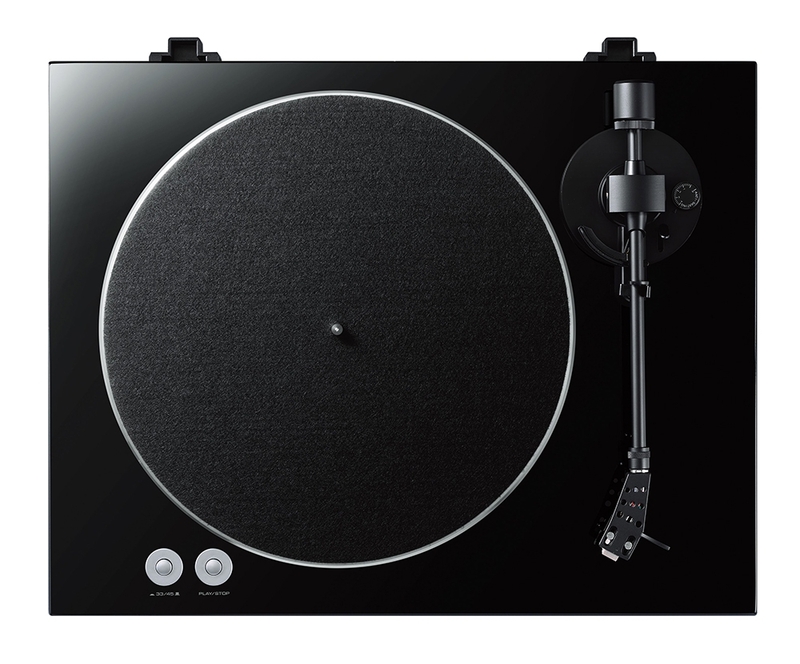 One of Yamaha's first turntables in more than three decades, as an entry-point product, the belt-driven TT-S303 was launched at this year's IFA at a dedicated event organized by youth-focused media group Vice. 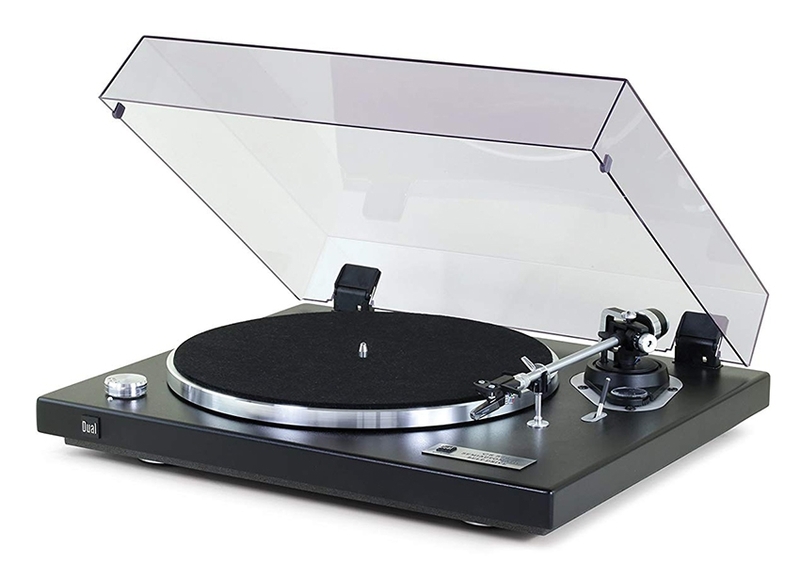 It pays homage to the Japanese company's iconic golden-age designs while remaining firmly based in modern notions of improved analog performance and ease of use. 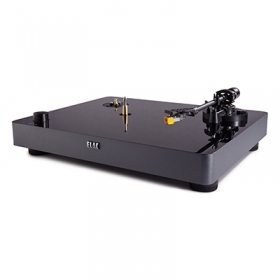 As most modern turntables, the TT-S303 includes a built-in phono EQ amplifier, which makes it instantly compatible with both amplifiers without a phono input as well as active speakers. 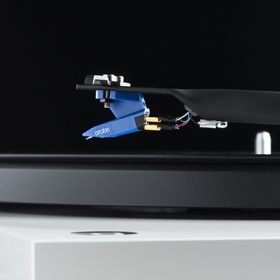 The preamp is by-passable, allowing you to use an external phono stage. 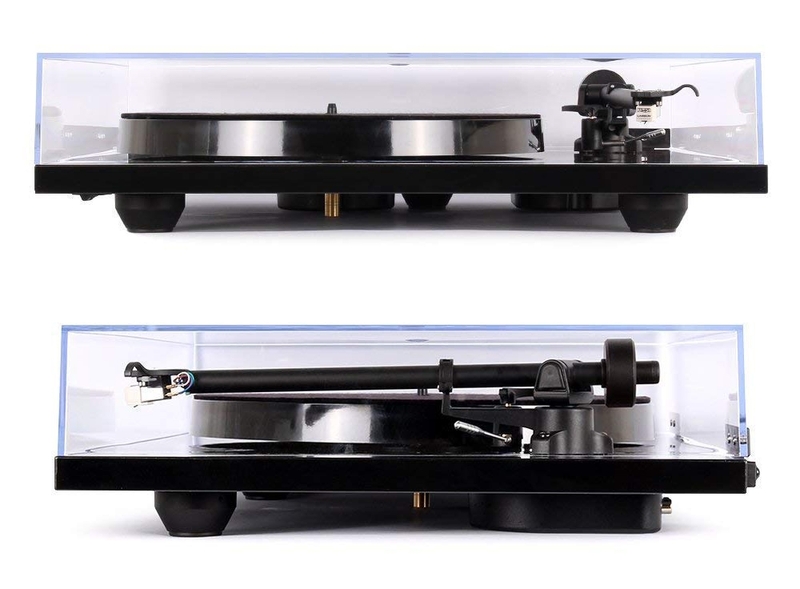 A static balanced straight tonearm for lightweight effective mass, anti-skate and an adjustable counterweight creates accurate stylus pressure for stable tracking and sound reproduction. 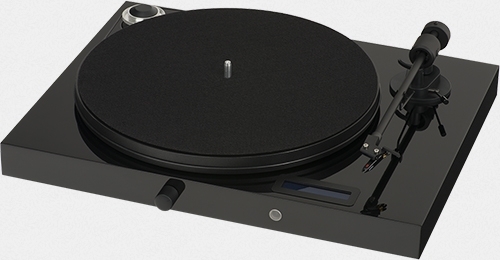 The tonearm is also factory-fitted with an Audio-Technica MM phono cartridge. 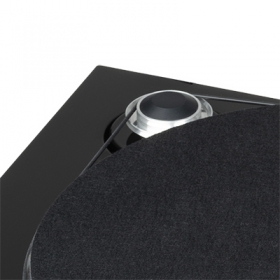 The aluminum platter with a high moment of inertia, topped by an anti-static felt mat, is driven by a DC motor with a durable rubber belt to achieve stable rotation and lower distortion. 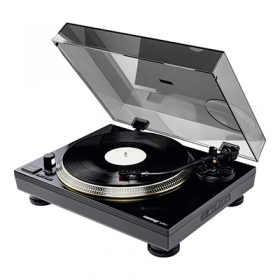 It comes with an external DC power supply to eliminate electronic interference and further reduce vibrations. 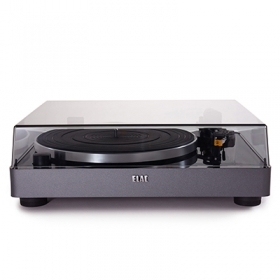 The plinth is built from a material with high internal loss and features sound isolation feet to prevent vibration. 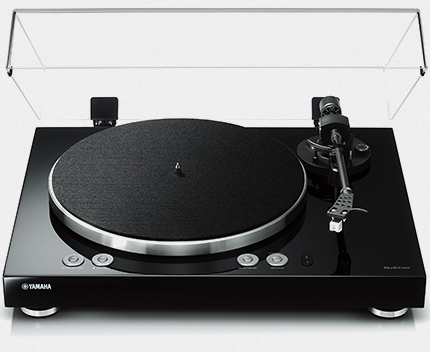 The TT-S303 comes in Yamaha's trademark Piano Black gloss finish, with and included dust cover. 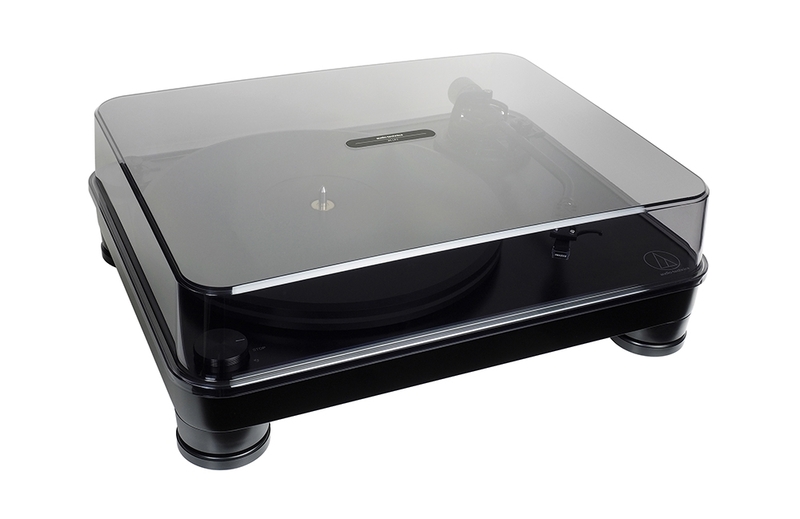 The Debut III S Audiophile is the latest model of Pro-Ject's Debut Line of turntables introduced in the late 1990s. 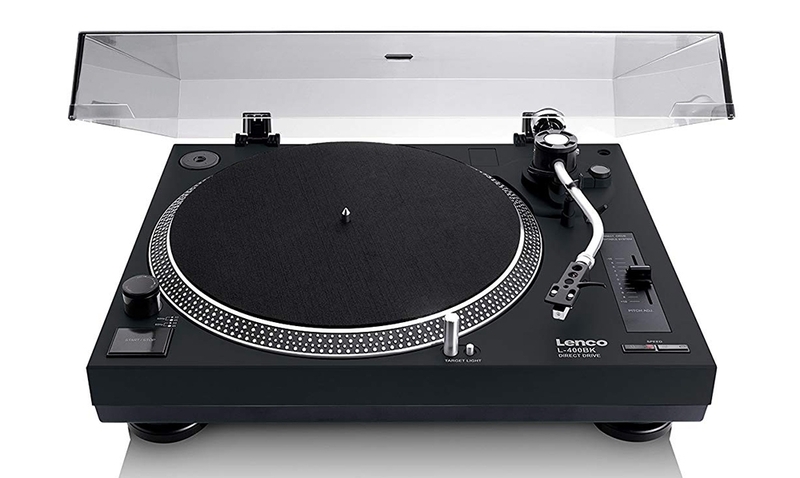 Modeled after the iconic, multi-award winning Debut design, it has new advanced features to enhance the look and performance. 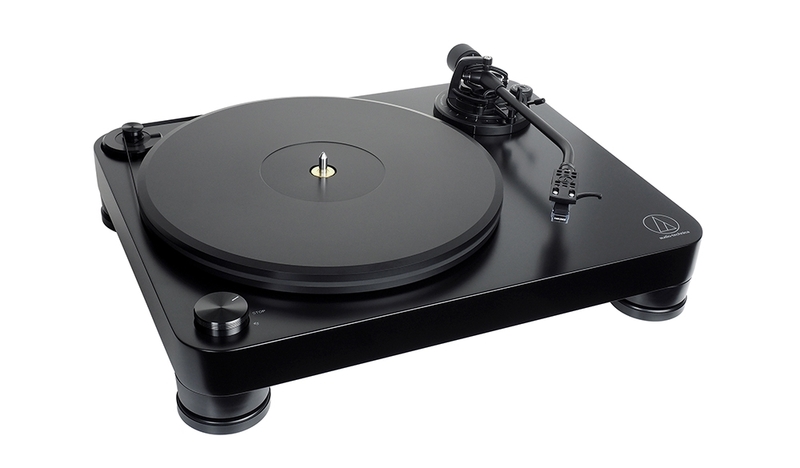 It's standout feature is the new S-shape tonearm, making this model the first widely available Debut turntable to not include a straight arm. 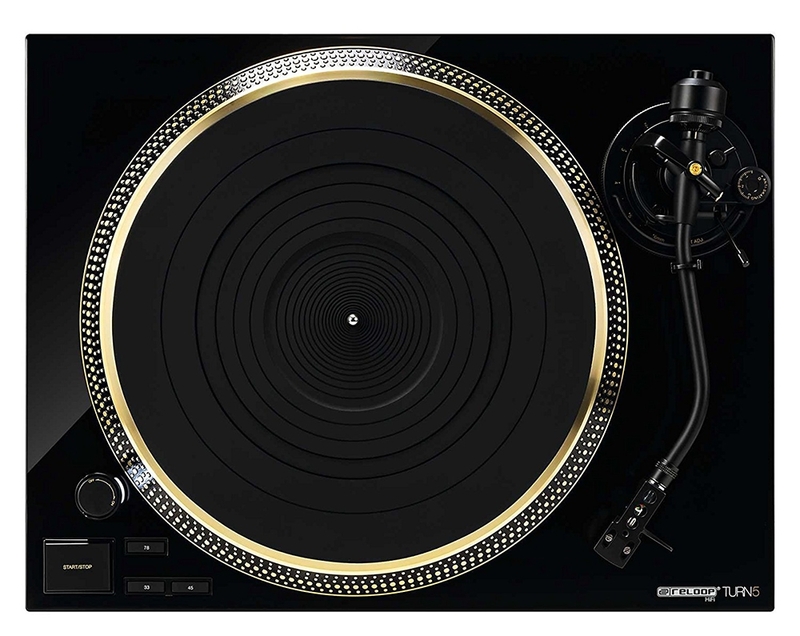 This design, compared to a straight one, is claimed to improve tracking and reduce distortion. 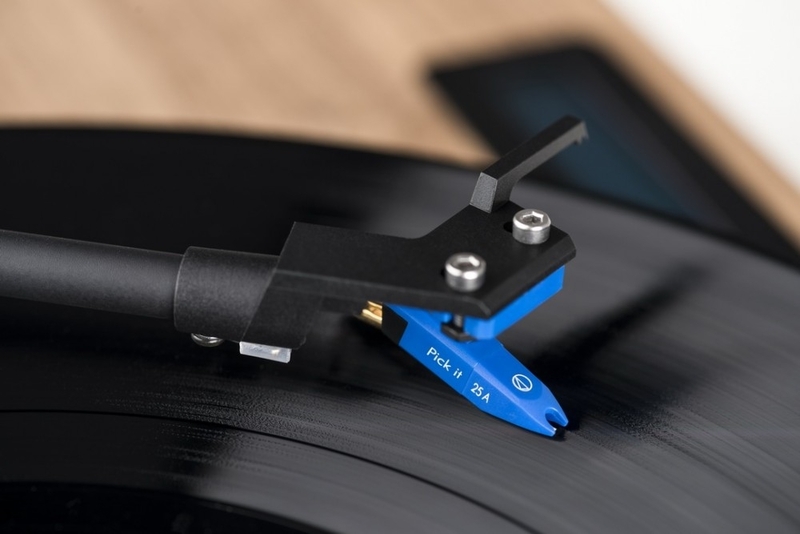 It has a sturdy, yet lightweight, one-piece aluminum construction and comes pre-installed with a brand new Pick it 25A cartridge, developed in partnership Ortofon. 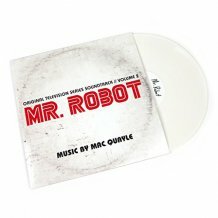 It's a moving-magnet cartridge based on the popular OM series but uses highly conductive silver-plated spools for a superior sound. 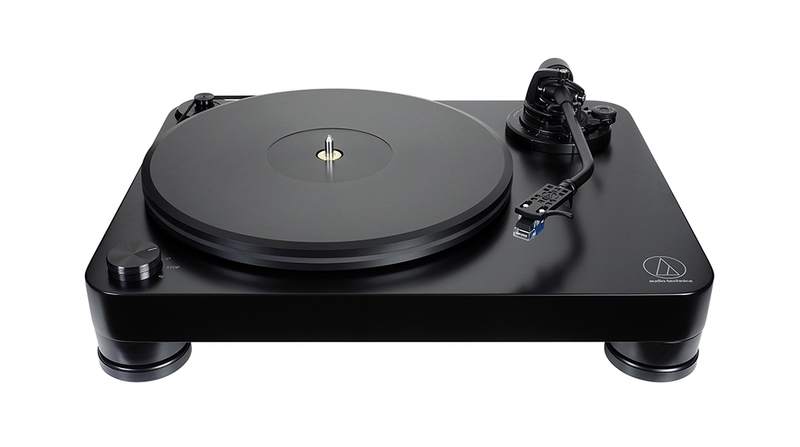 The Debut III S Audiophile includes the same belt-drive motor, AC generator and 1,3kg 12" steel platter assembly as the award-winning Debut Carbon model. 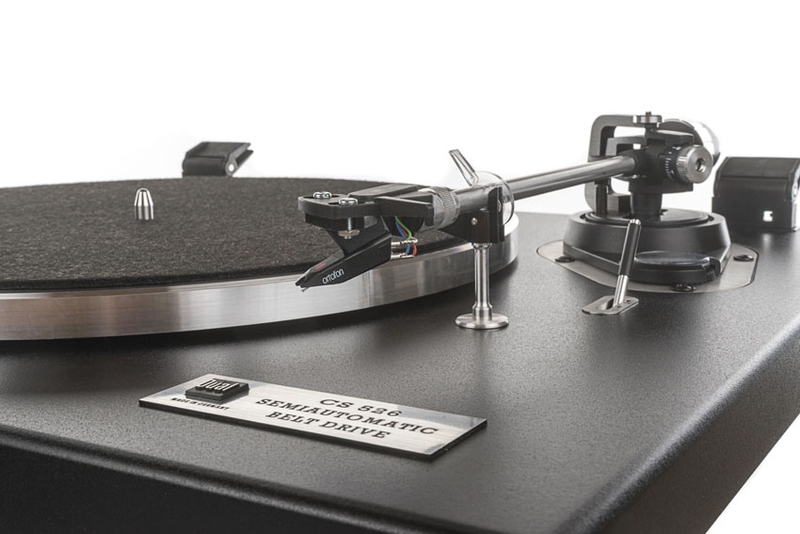 Performance is further improved using the newly developed aluminum/TPE isolation feet, inspired by more expensive designs in the Pro-Ject line of turntables. 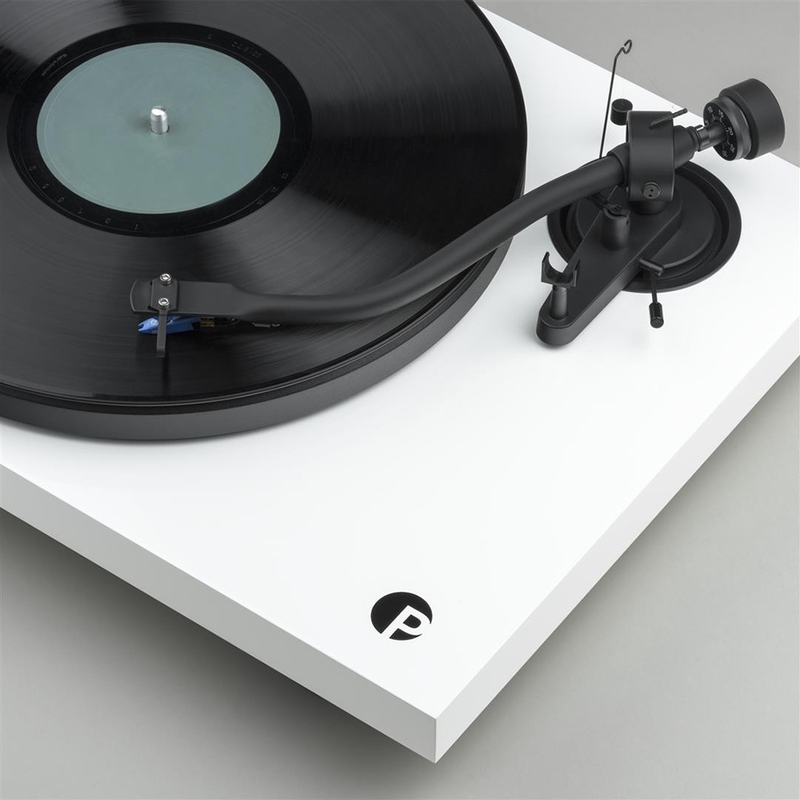 Available in high-gloss black or white finishes, it is first turntable to feature the new Pro-Ject logo on the plinth, as well as on the included acrylic dust cover. 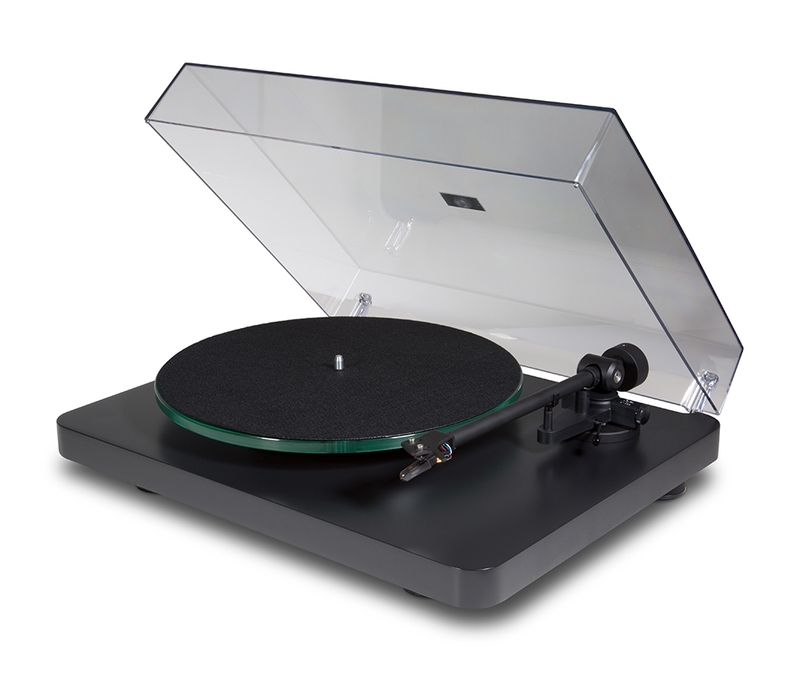 The unit is supplied with Pro-Ject's Connect-IT E RCA cables and an anti-static 12" felt mat. 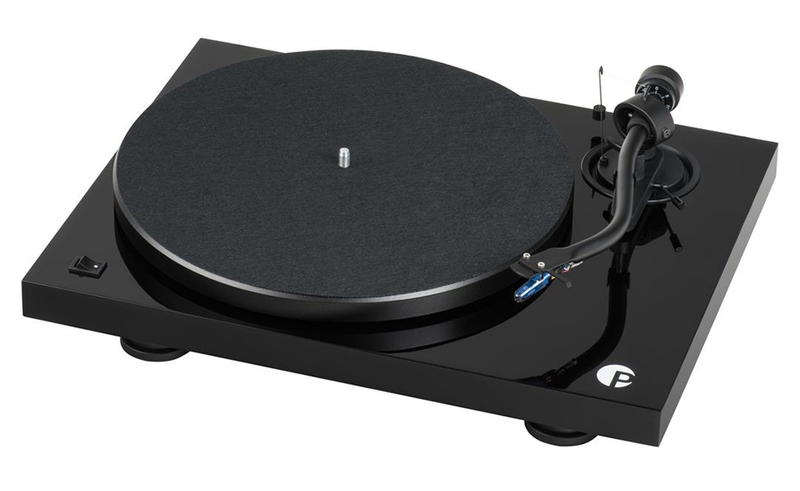 The upgraded version of Rega's all-time best-selling Planar 1 turntable, the Rega P1 Plus made its debut at the Bristol Show 2018, and first ever Rega record player to include a built-in phono stage. 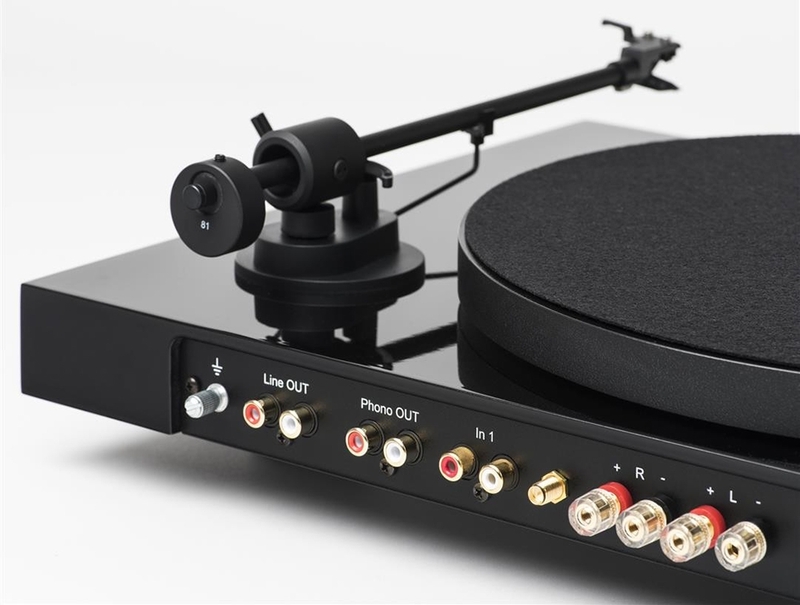 The phono preamp is a modified version of Rega's award-winning Fono Mini A2D, without the analogue to digital converter and USB output. 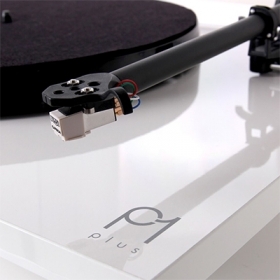 This makes the Plus model slightly more affordable than the two units, P1 and Fono Mini A2D combined. 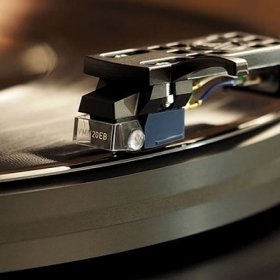 Placed beneath the tonearm, the shielded wire from the cartridge is soldered directly to the circuit, which prevents interferences picked up by the external cable between the tonearm and stage. One downside is that it can't be turned off and used with an external phono preamp. 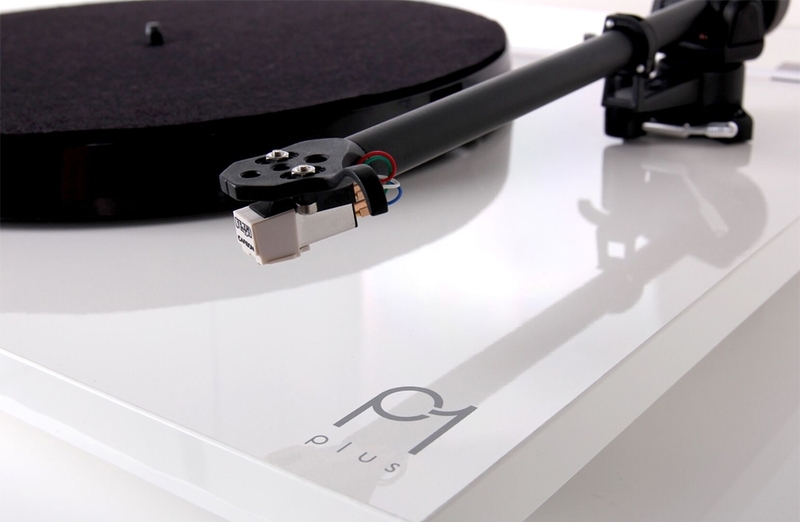 Based On the Planar 1, the Plus model benefits from all of the advantages of its sibling. 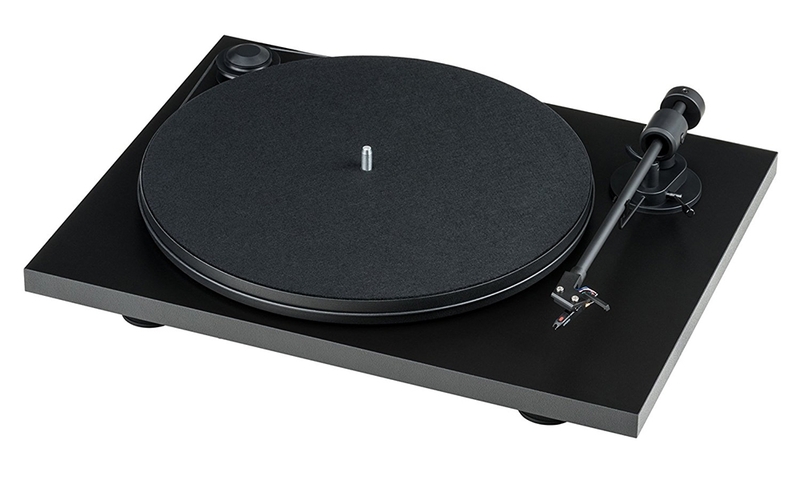 A low noise 24v synchronous AC motor, precision hub bearing assembly, hand made RB110 tonearm with zero play bearings and ultra-low friction performance, a factory fitted Rega Carbon cartridge, and high-mass phenolic platter. 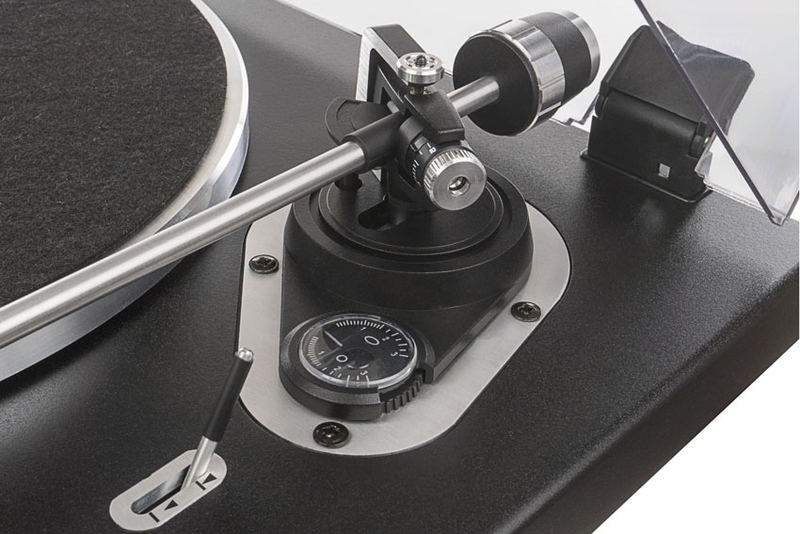 The arm has a stop point so you can fit the counterweight without having to use a stylus gauge, and includes automatic bias adjustment integrated in the arm clip, making setup easier for beginners. 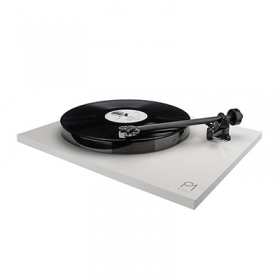 The Planar 1 Plus has a Thermoset, gloss laminated plinth available in black and white finishes. 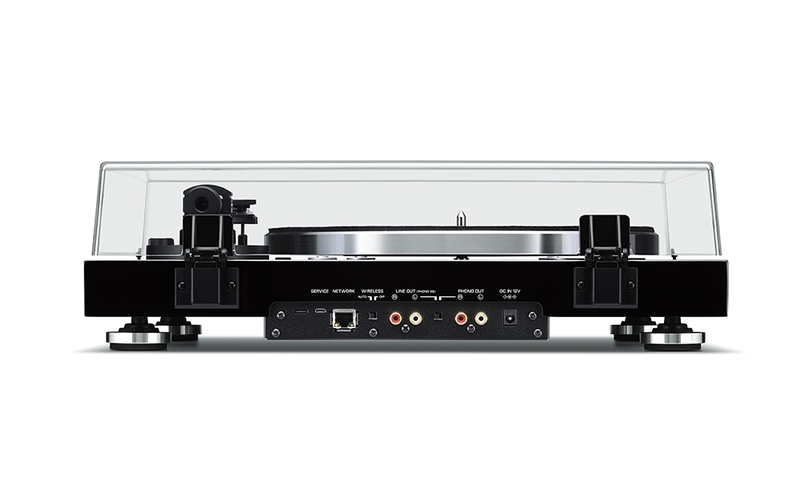 Pro-Ject Audio's Juke Box E is an all-in-one record player with phono stage, line pre-amplifier, power amplifier and Bluetooth receiver, housed in a stylish compact chassis. 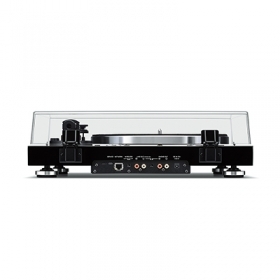 Requiring only a pair of speakers to make a complete hi-fi system, the performance and level of convenience of the unit is unprecedented for the price. 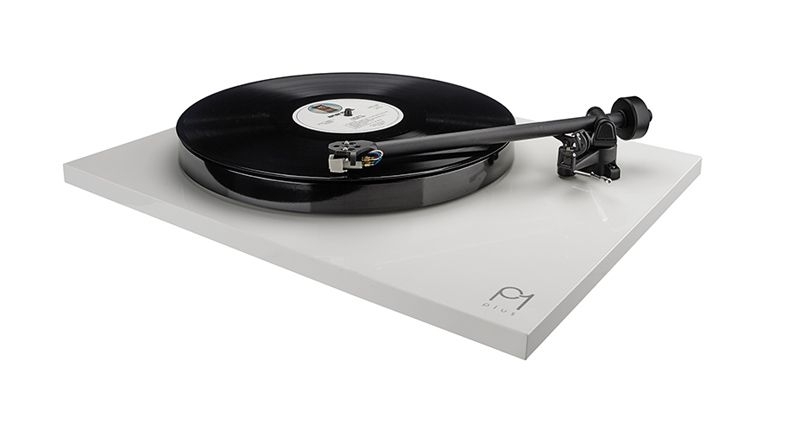 Built into the plinth is a premium integrated amplifier with 50W per-channel output and a moving-magnet phono preamp based on Pro-ject's acclaimed Phono Box technology. 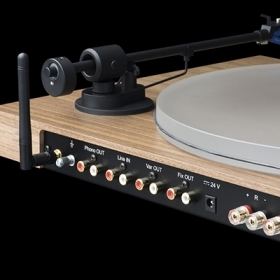 On the back panel of the deck there is a line level and a phono level RCA output, a stereo RCA line-level input, an aerial socket for the Bluetooth receiver, and a set of RCA outputs for left and right speakers. 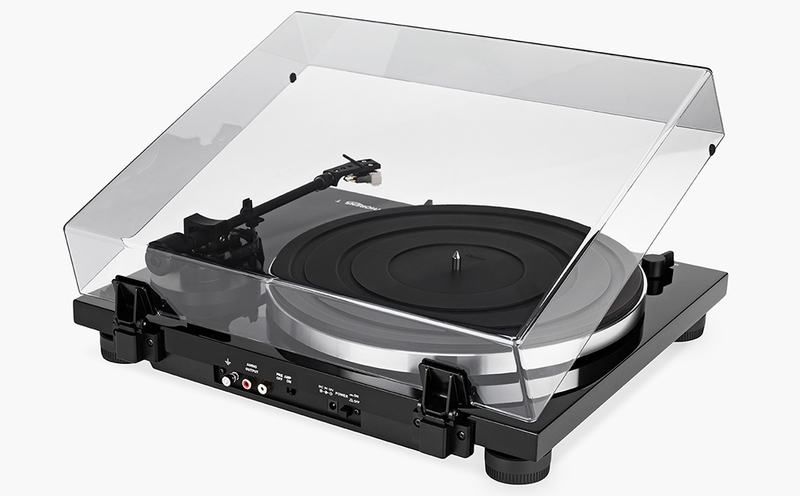 The Juke Box E can't receive lossless signal via Bluetooth as it doesn't support the aptX HD codec for hi-res audio. 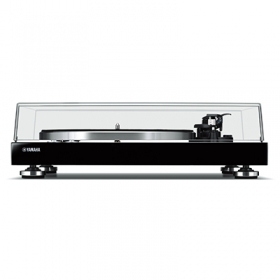 The line level input however allows you do add a more capable digital source to the system. 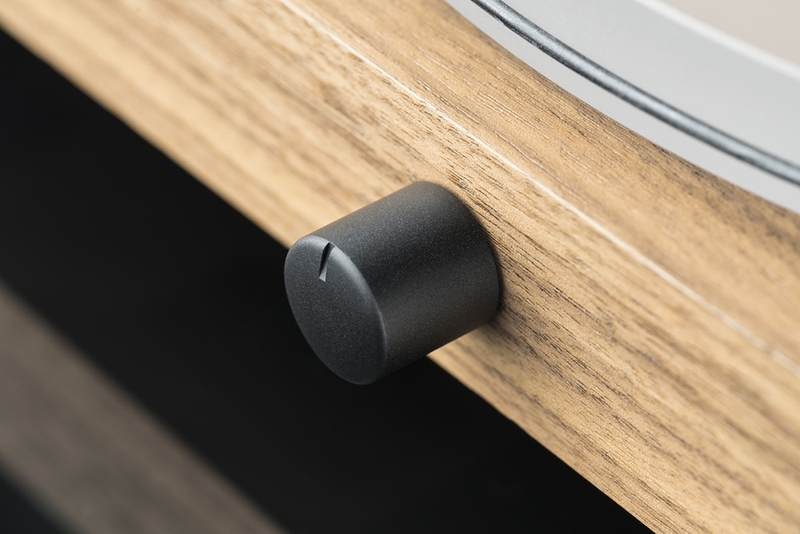 At the front you'll find a 32-step turn/push dial for volume and input selection (turntable, line or Bluetooth), and pretty obvious IR receiver for the supplied remote control. 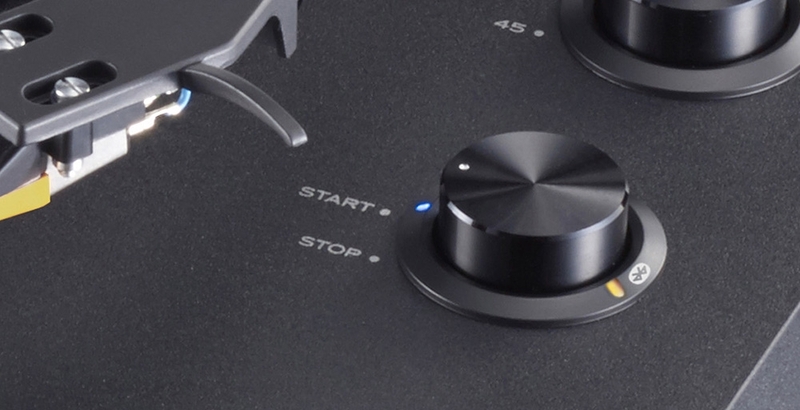 Beside switching inputs and adjusting volume, the remote has buttons for bass and treble adjustment and a loudness boost. 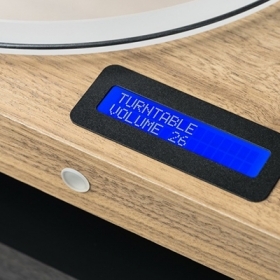 The top panel of the plinth features a high-contrast display, showing the selected source and volume level. 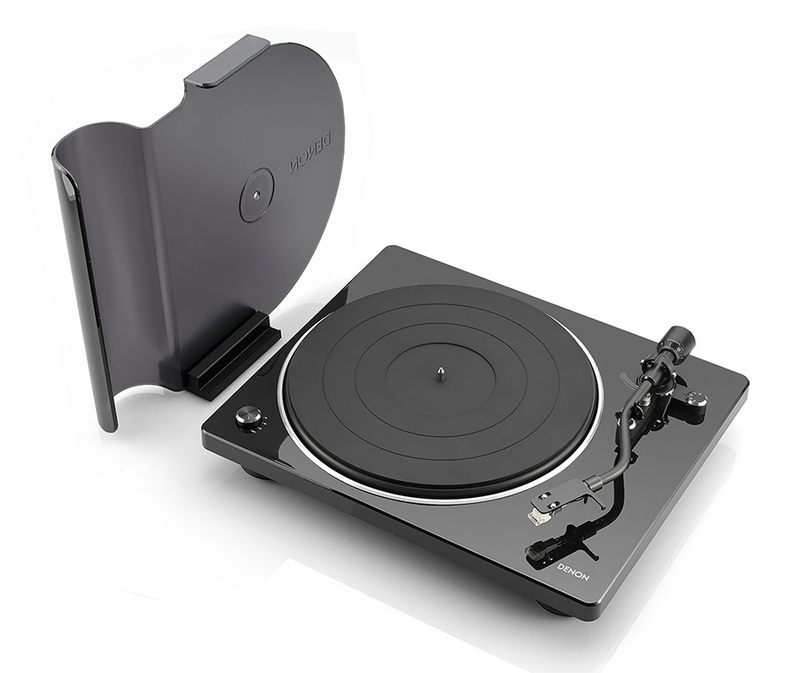 The turntable itself is based on the successful Pro-Ject Primary design. 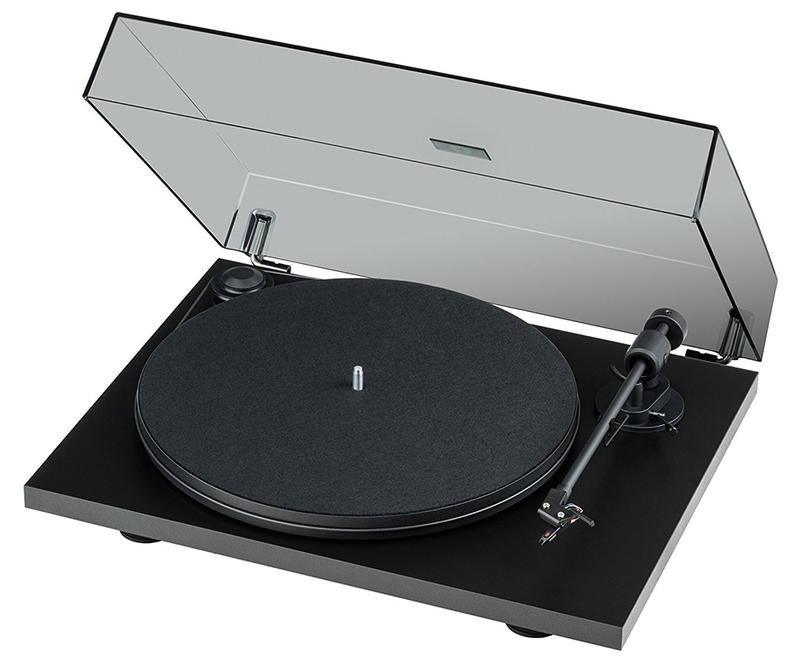 It features a 8.6" aluminum tonearm with sapphire bearings, an MDF platter with felt mat, pre-installed and aligned Ortofon OM 5E cartridge, perimeter belt-drive operation and a low-vibration synchronous motor with aluminum pulley. 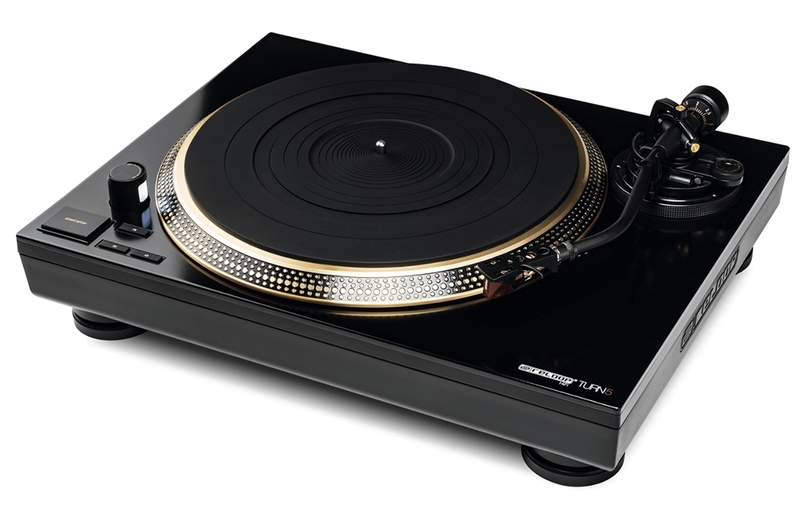 To set the turntable up for playing there's no need to adjust the anti-skate or counter-balance, simply install the belt and it's ready to spin. 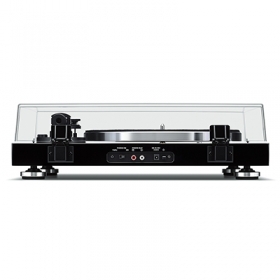 The deck has a quality overall construction, with a sturdy and heavy plinth, special decoupling feet and removable acrylic dust cover. 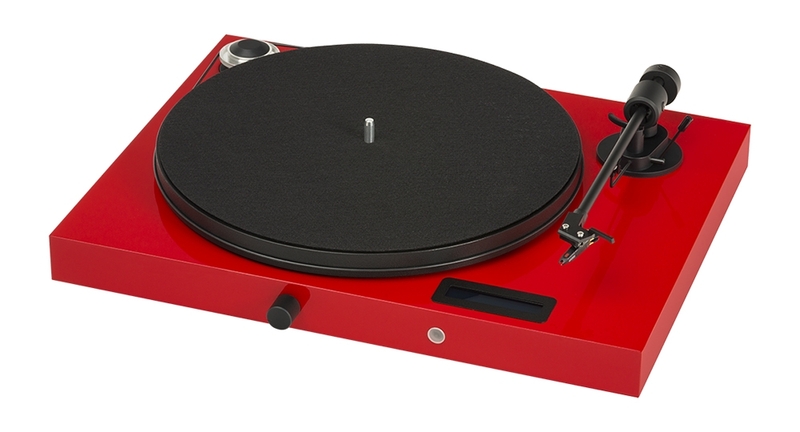 The Juke Box E is available in three high gloss colors: black, red and white. 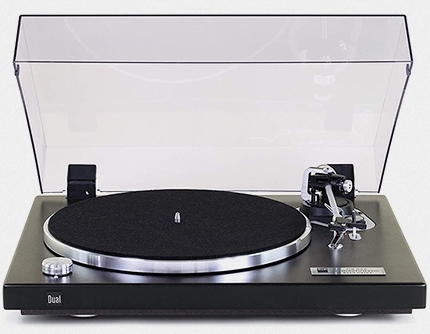 Launched in Germany at Westdeutsche Hifitage 2018, both new Thorens turntables are aimed at committed newcomers, or anyone looking for a robust, easy to use manual record player. 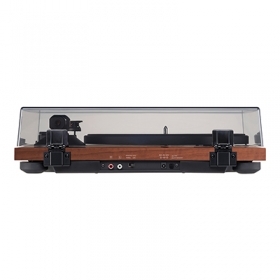 They are belt-driven decks with plug-and-play design, preconfigured cartridges, as well as integrated bypassable phono stages for direct connection to any amplifier, receiver or external phono preamps. 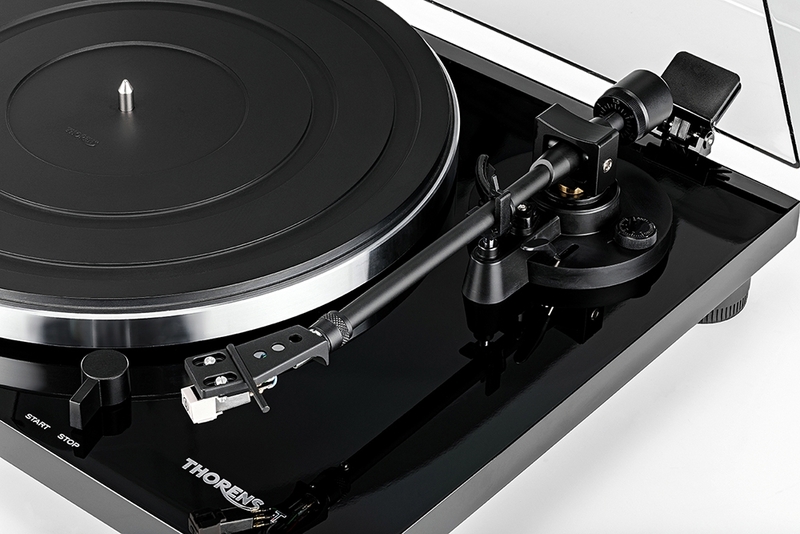 Available in high-gloss black, both come with Thorens' new TP 71 straight tonearm with detachable head-shell, enabling easy cartridge swaps, a smooth running belt drive, and an aluminum die-cast platter with rubber mat. 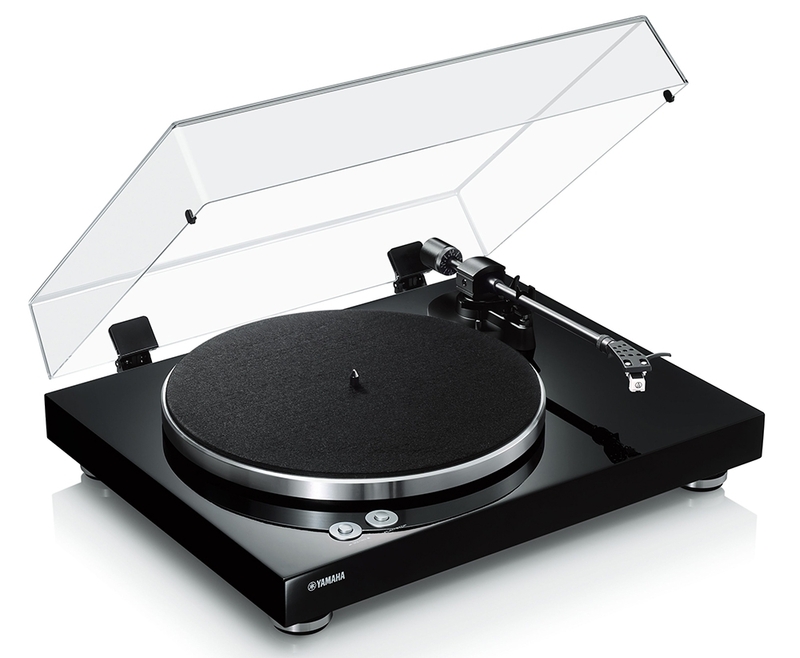 The TD 201 is pre-fitted with an Audio-Technica AT 3600 phono cartridge, while its bigger brother uses an AT 95E. 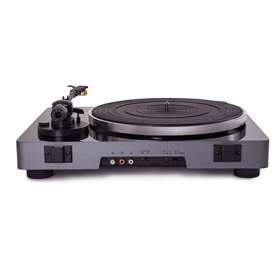 The TD 202 also comes with a slightly larger plinth, and the built-in phono stage includes an additional A/D (analogue-to-digital) converter with USB output. 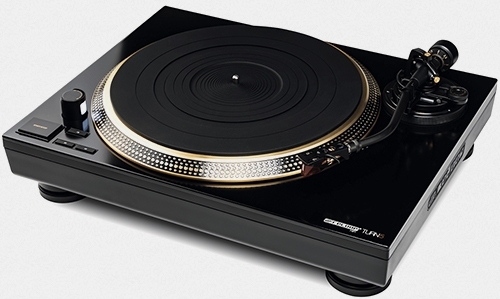 This year Denon launched two new turntables as part of its Design Series. 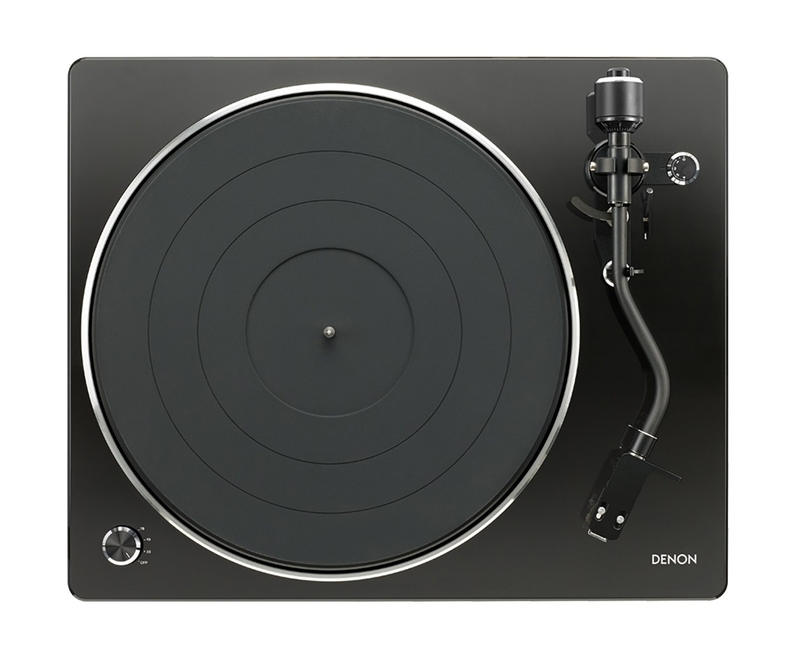 Both the Denon DP-400 and Denon DP-450USB are belt-driven, manual record players, but feature an automatic playback stop and tonearm lift mechanism. 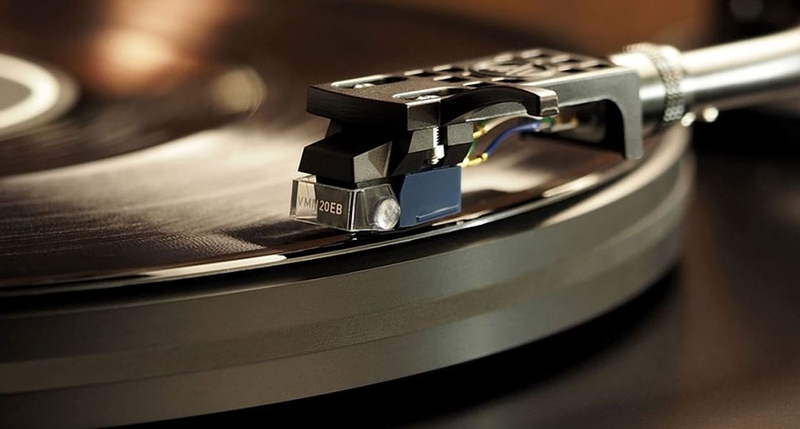 This means that roughly ten seconds after the stylus reaches the run-out groove of the record, rotation of the platter stops and the tonearm is lifted which help reduce needle and vinyl wear. 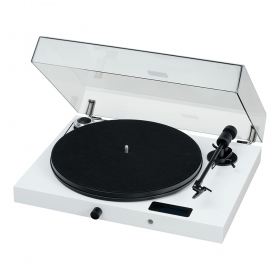 In addition, the DP-450USB has a built-in analog-to-digital converter that can record your vinyl directly to a USB storage device via the front-facing USB-A output. 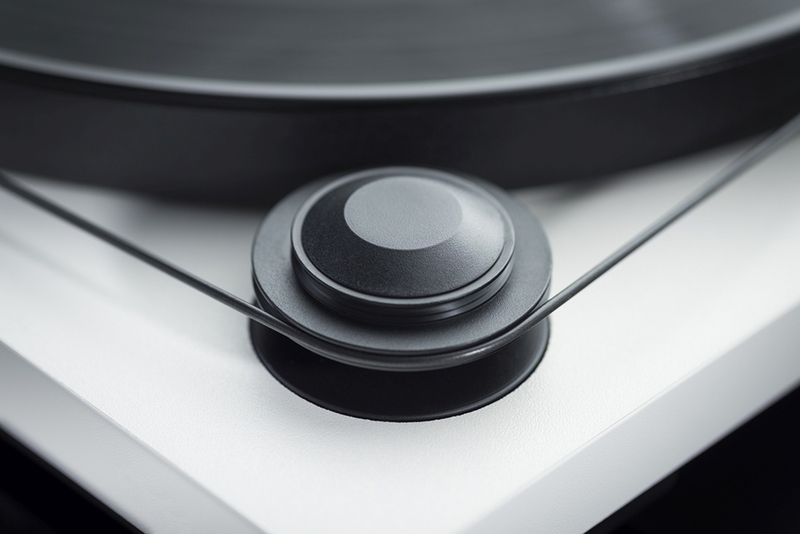 At the press of a button you can also select the recording's audio format, MP3 (compressed) or WAV (uncompressed). 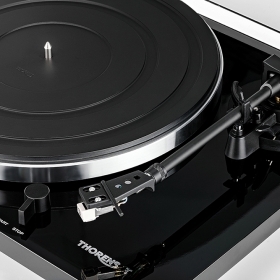 Like most turntables released this year, both models come with a bypassable phono stage. 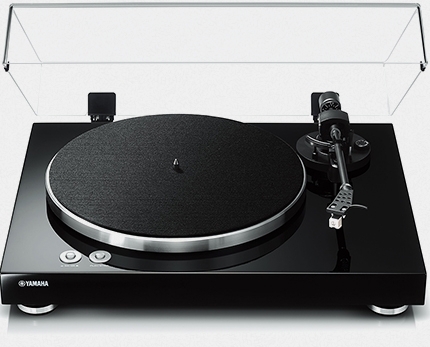 The glossy black plinth is only 41cm wide which makes it blend perfectly with Denon's Design series products. 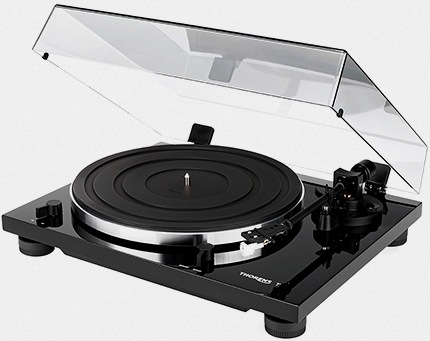 The platter is also partially sunk into the turntable housing, making it look more compact. 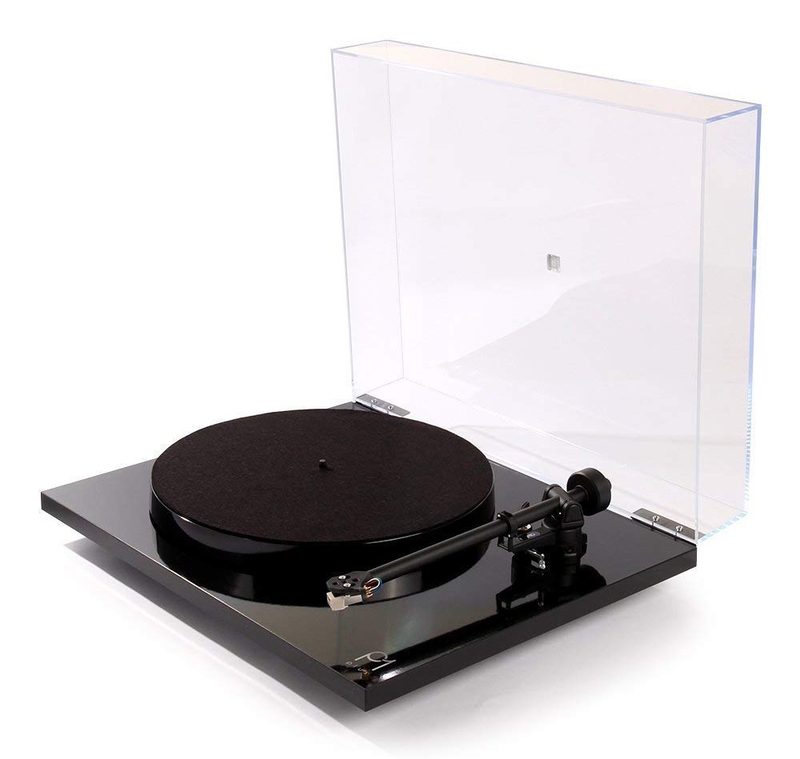 It features a carefully engineered S-Shape tonearm with optimized tracking angle at any point of the record, a universal headshell, and pre-fitted MM cartridge. 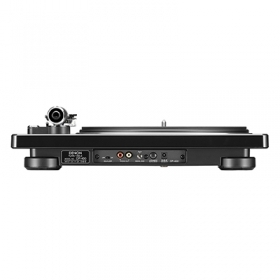 The weighted, die-cast aluminum platter supports 33 1/3, 45 and 78 RPM records, and its rotation is accurately controlled by an integrated speed sensor, preventing unwanted speed fluctuations during playback. 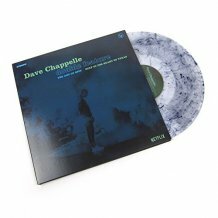 The DP-400 and Denon DP-450USB comes with an exclusively designed, removable dust cover, that doubles as an album cover display stand. 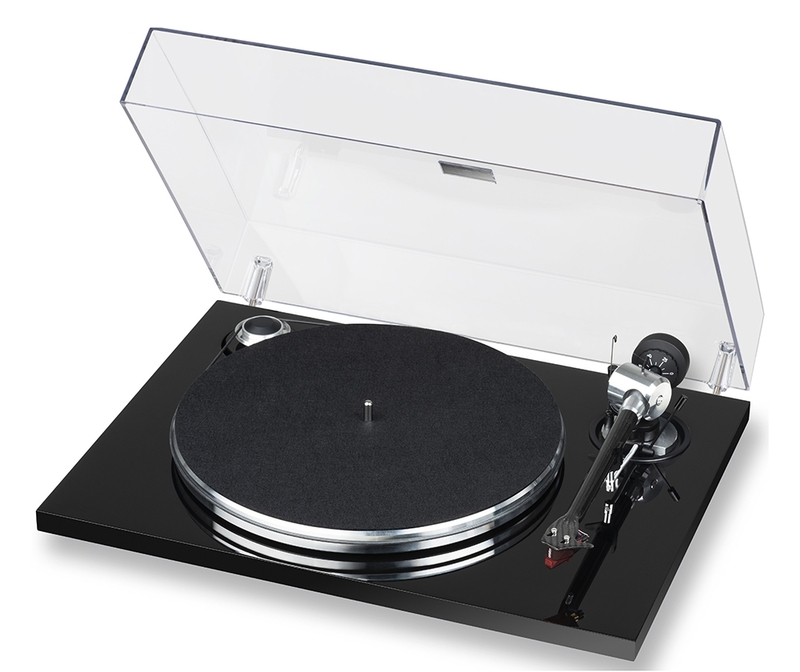 Its design enhances the overall look of the turntable while eliminating vibration issues associated with attached covers. 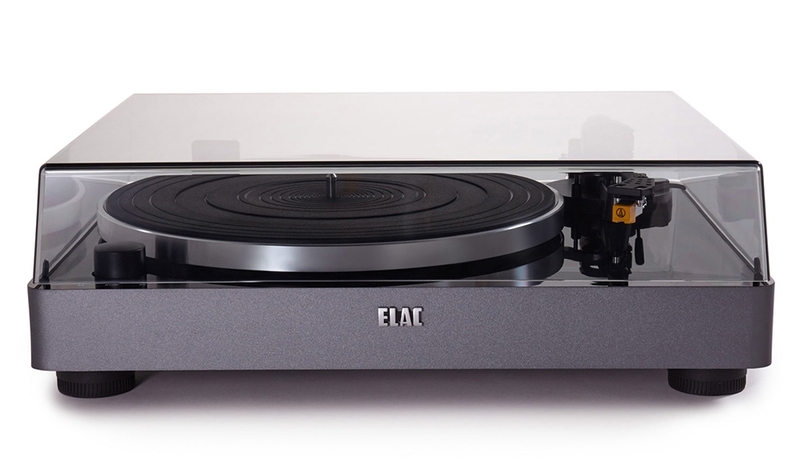 German loudspeaker brand ELAC celebrates its 90th anniversary by adding three turntables to its production line, to complement the ELAC loudspeaker family, and pay tribute to the Golden Age of stereo when turntables reigned supreme. 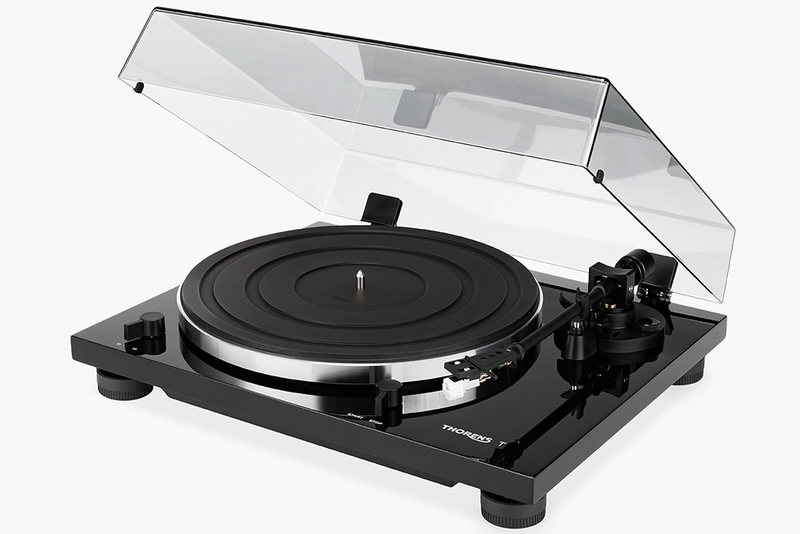 Sitting below the Miracord 90 Anniversary and Miracord 70, the Miracord 50 is the entry-level model of the range. 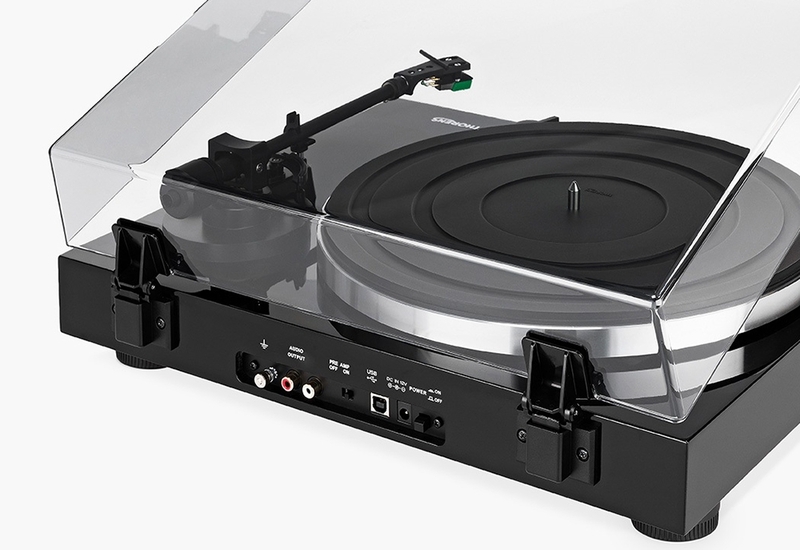 It's carefully engineered with a belt-drive motor and die-cast aluminum platter. 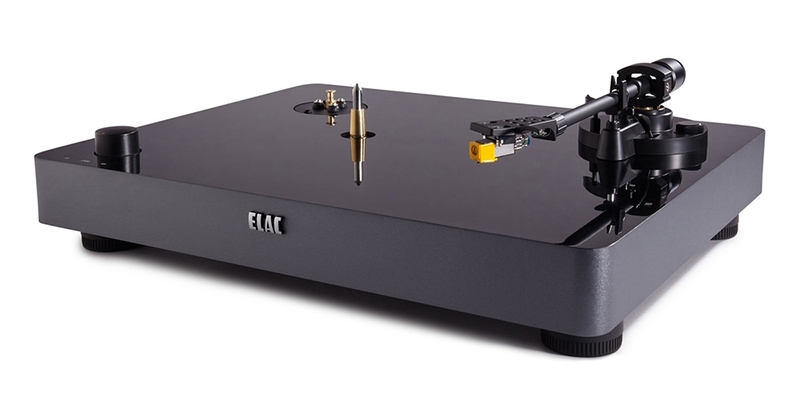 The static balanced straight tonearm has precision bearings, anti-skate adjustment and removable bayonet-style headshell. 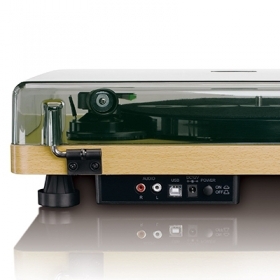 It also features a factory-mounted Audio-Technica AT91 moving magnet phono cartridge. 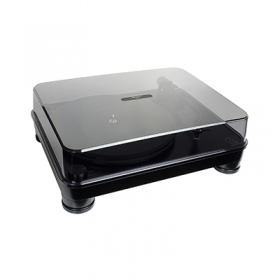 The Miracord 50 is equipped with a built-in switchable phono preamplifier, allowing you to add this turntable to virtually any music system. 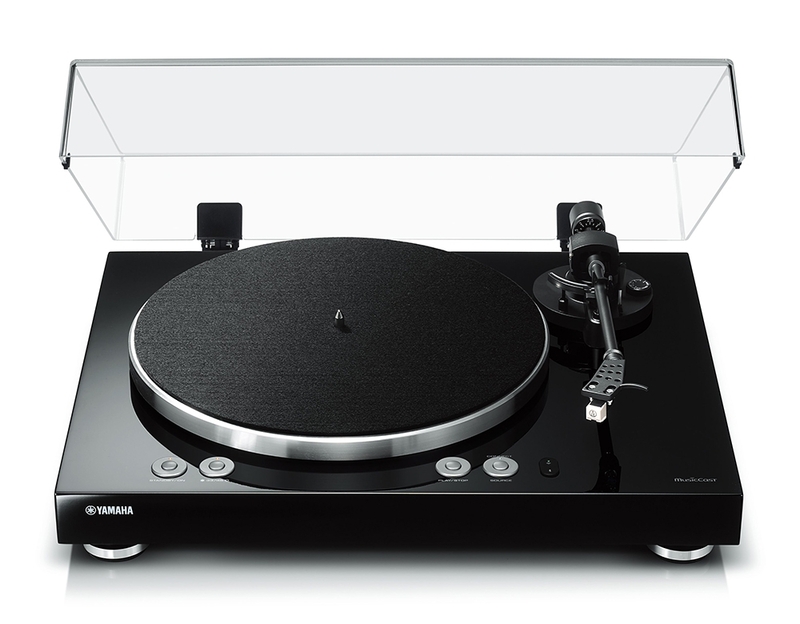 Being part of Yamaha's new turntable range, the VINYL 500 or TT-N503 offers the same build and basic record-playing features as the TT-S303, but with wireless technology. 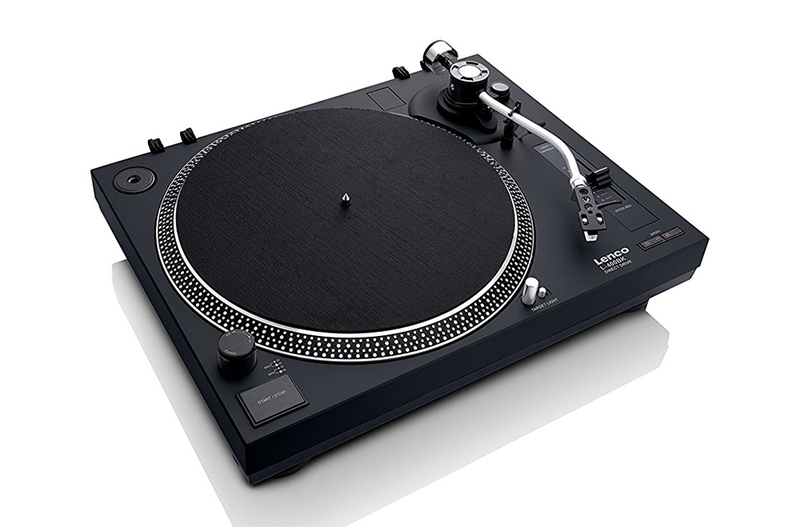 It was designed as part of the MusicCast product family, the company's Wi-Fi and wireless speaker system, similar to Sonos. 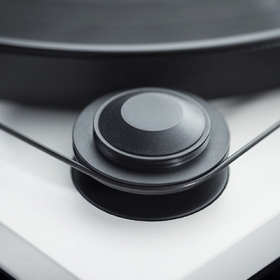 Featuring multi-room capabilities, you can wirelessly connect to MusicCast speakers and other devices throughout the house, and listen to your records without all the cables. 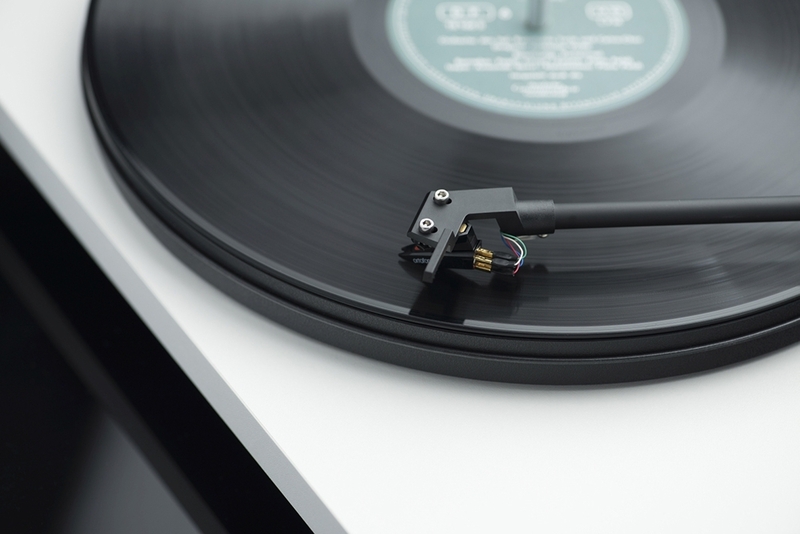 The MusicCast Vinyl 500 can access and play music files stored on a network (up to 24-bit/192kHz and DSD 11.2MHz), as well as from music streaming services like Spotify, Tidal, Deezer and Qobuz. 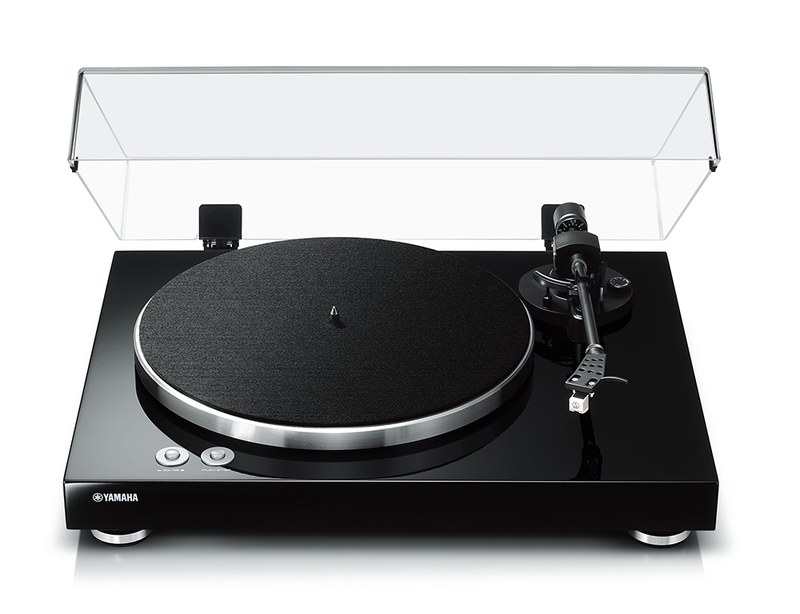 It also has built-in Bluetooth and AirPlay connectivity, and integrated Alexa voice control compatibility. Originally founded in London, now Canadian hi-fi company NAD Electronics International has been a leading manufacturer of premium home audio products for over 45 years now. 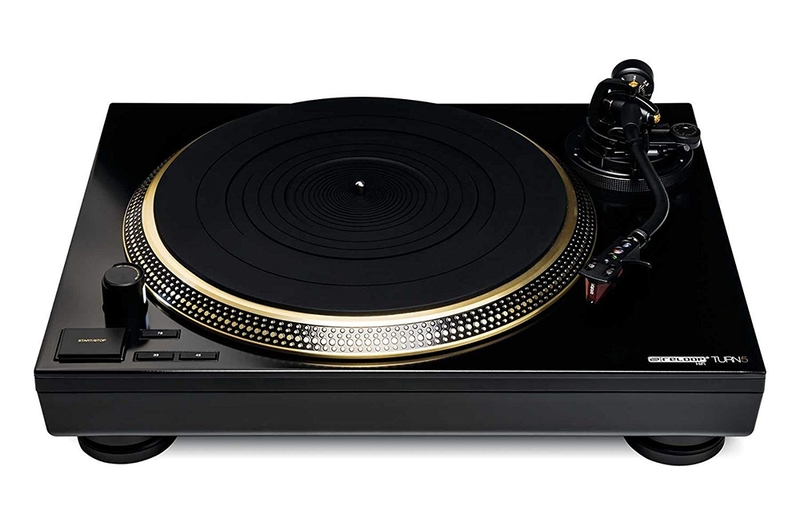 Already announced last year, but made available in 2018, the C 558 is NAD Electronics' latest addition to its affordable line of turntables. 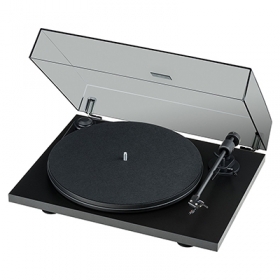 It's a manual, belt-drive turntable with a classic design and delivers an outstanding listening experience. 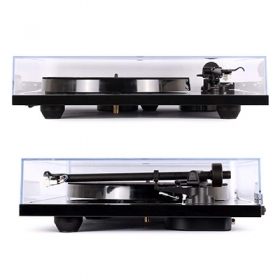 The C 558's motor uses a two-step pulley with specially developed belt that is flat ground for precision, and drives a non-resonant sub platter which sits in a brass bearing with a hardened steel shaft. 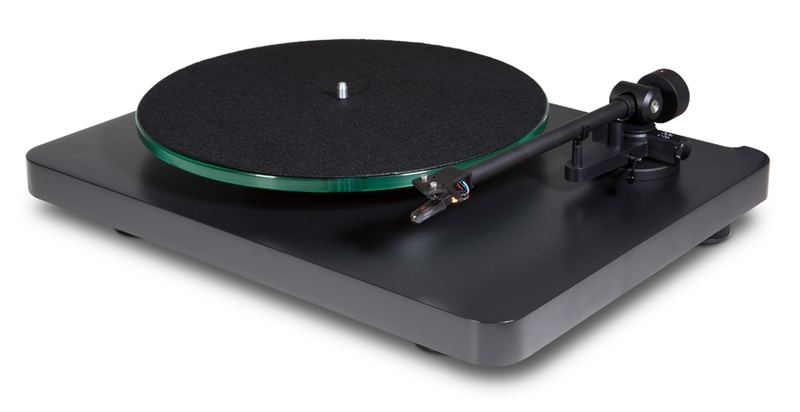 This then supports a 3.85-pound solid glass platter, topped by a felt record mat. 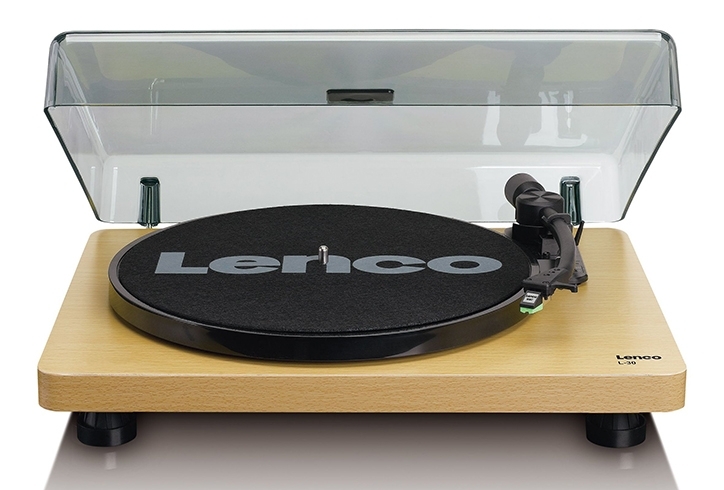 All rotating parts are machined to tight tolerances to eliminate any vibration in the drive system. 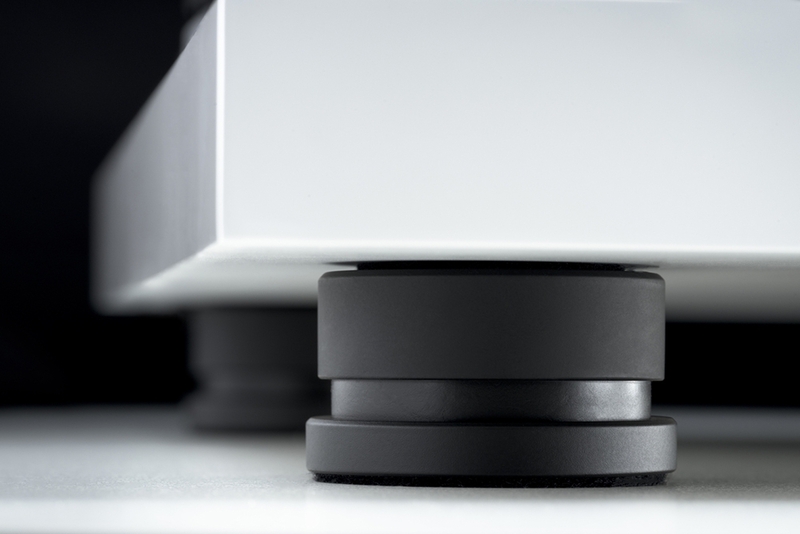 The isolated power supply transforms the AC mains of your wall socket into a pure DC voltage, and then electronically generates a precise and stable AC voltage that powers a synchronous motor and achieves nearly perfect speed consistency and smoothness. 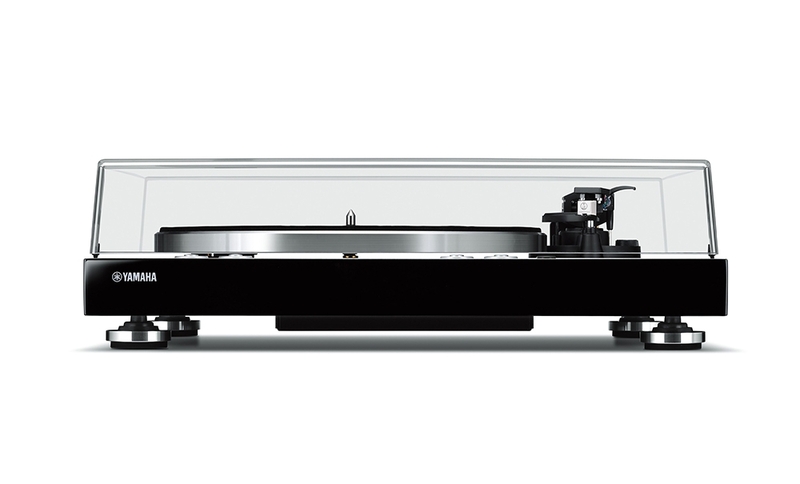 The C 558's 9" long aluminum alloy tubular tonearm with a nonremovable headshell offers low tracking distortion, while it maintains rigidity and low mass. 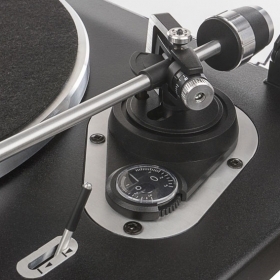 By allowing adjustments for azimuth and vertical tracking force, the tonearm provides a precise tracking. The tonearm also comes with a factory fitted and aligned Ortofon OM Super 10 cartridge. 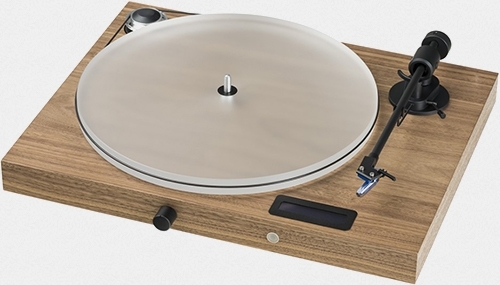 The main body of the turntable is a heavy, CNC machined MDF, finished in NAD's usual color palette. 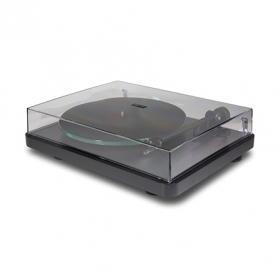 The dust cover is made from a non-resonant Perspex with a counter-sprung hinge design. 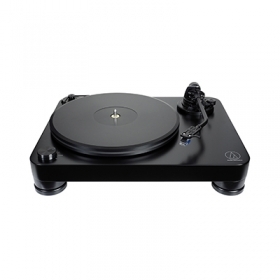 The AT-LP7 is fully manual, belt-drive turntable designed around Audio Technica's VM cartridge line, which employs the company's patented V-shaped Dual Magnet design. 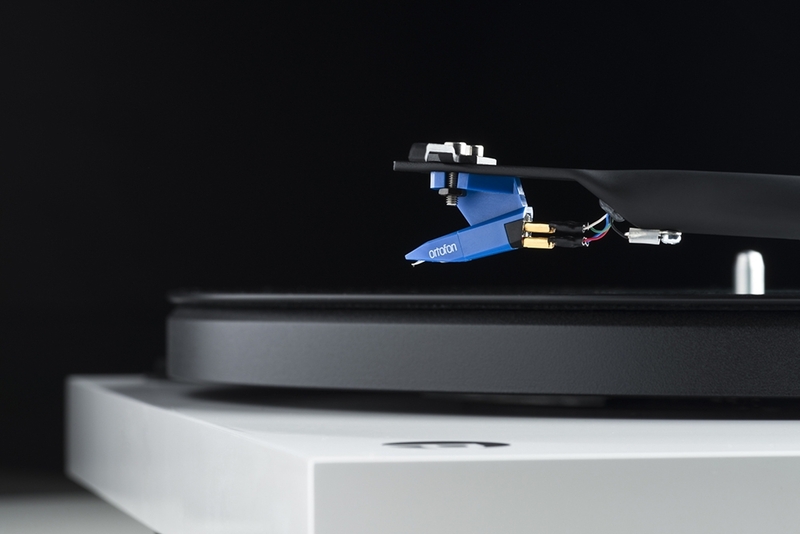 In support of the cartridge's performance, the new AT-LP7 also incorporates high-quality materials and professional engineering. It provides 33 and 45 RPM speeds while its belt drive ensures quiet, stable playback and isolation from motor and mechanical noise. The turntable's plinth is constructed of 40mm thick MDF, an excellent vibration damping material that inhibits acoustical feedback. 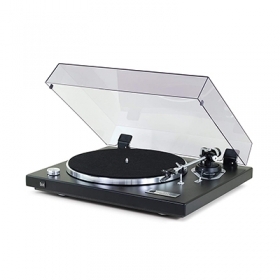 This is supplied with a stylish removable dust cover, and a 45 RPM adapter. 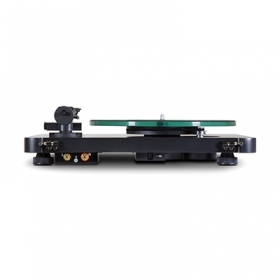 The platter is made of 20 mm-thick polyoxymethylene, a stiff, low friction thermoplastic and is driven by a sensor-monitored motor that ensures a continuously accurate speed. 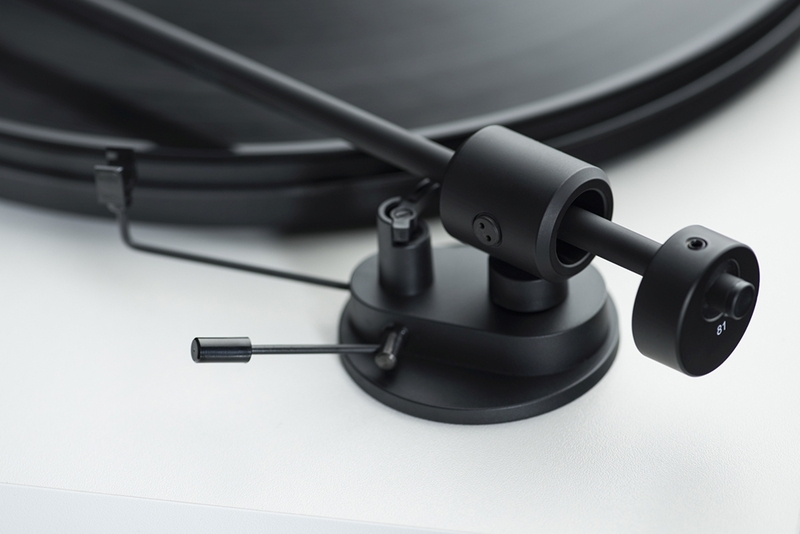 The unit comes with a J-shaped tonearm that takes its inspiration from the original Audio-Technica arms of the 60s and 70s, and it's designed to minimise tracking error. 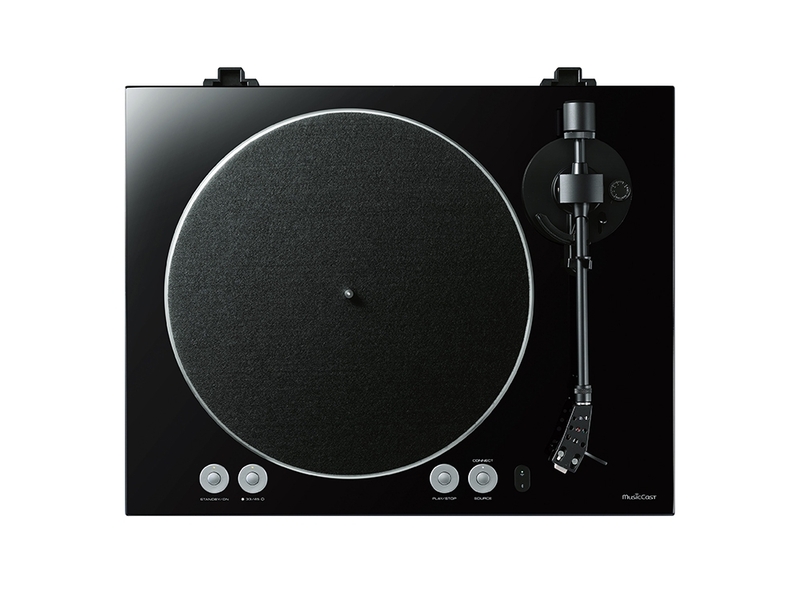 This makes use of a metallic gimbal suspension system and precision bearings, and includes an adjustable counterweight and anti-skate control. 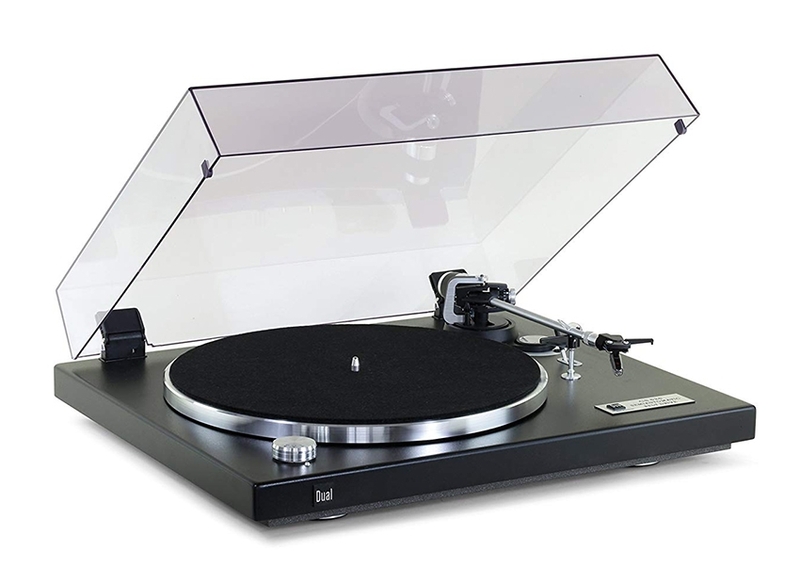 Also adjustable is the height of the tonearm (0 mm to 6 mm), to accommodate a wide variety of platter mats and cartridges. 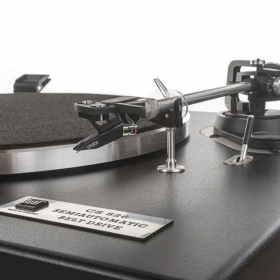 Pre-mounted on the lightweight, 10g removable AT-HS10 headshell there is a VM520EB cartridge with 0.3 x 0.7 mil elliptical bonded stylus. 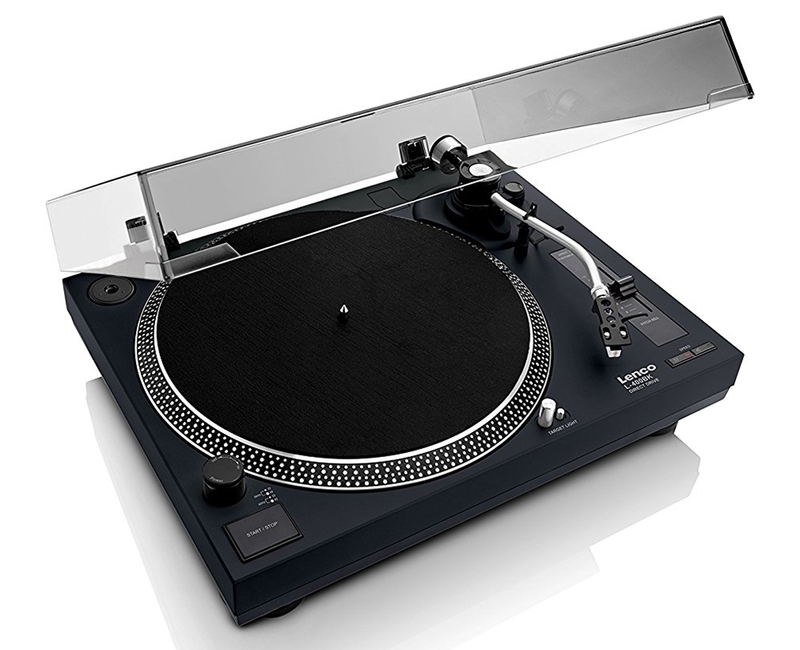 This can be replaced with any of the other six styli available in the VM line. 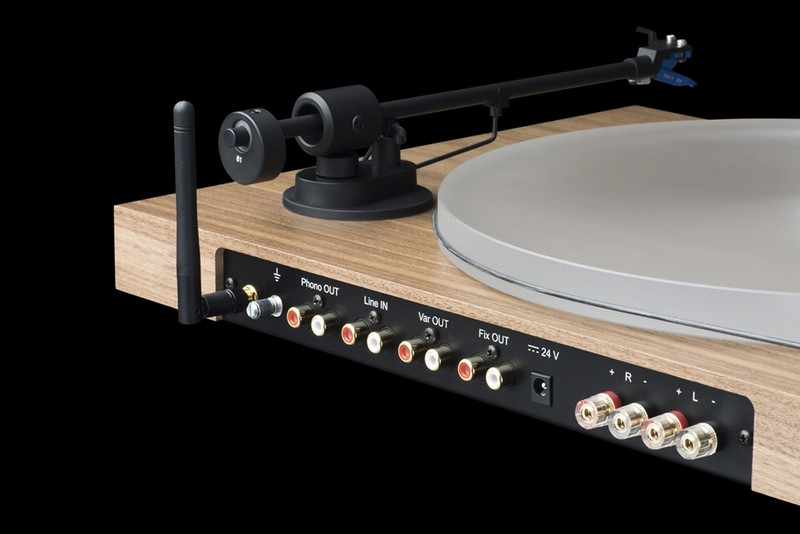 There is also a built-in switchable phono preamp and a switch for either moving-magnet or moving-coil cartrige operation. 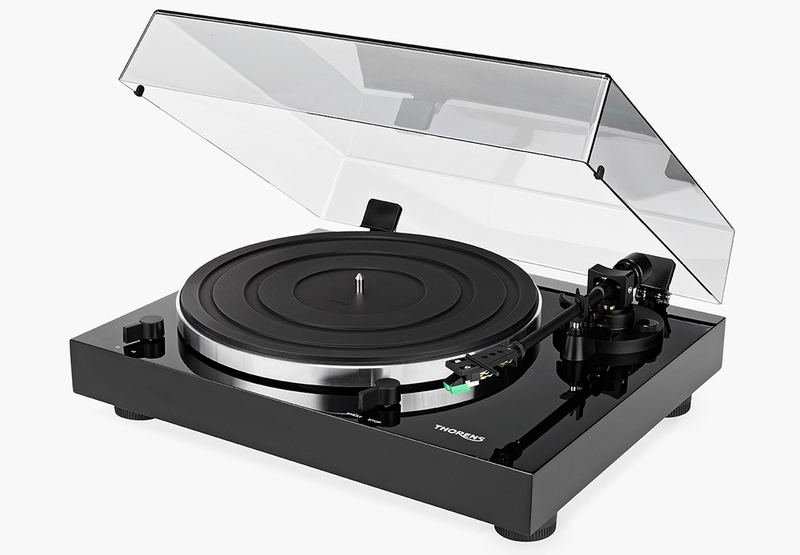 Reloop's TURN 5 is a quartz-controlled, direct-drive hi-fi turntable with the aspect and features of the ever popular Technics SL-1200. 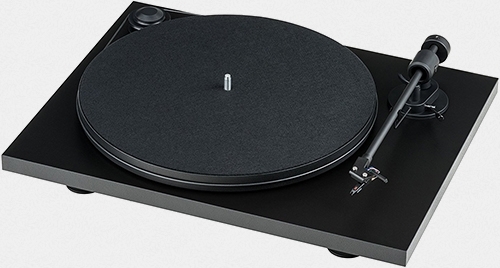 This is the third TURN model, following the 2016 debut of the TURN 3 and last year's TURN 2, both belt-driven designs. 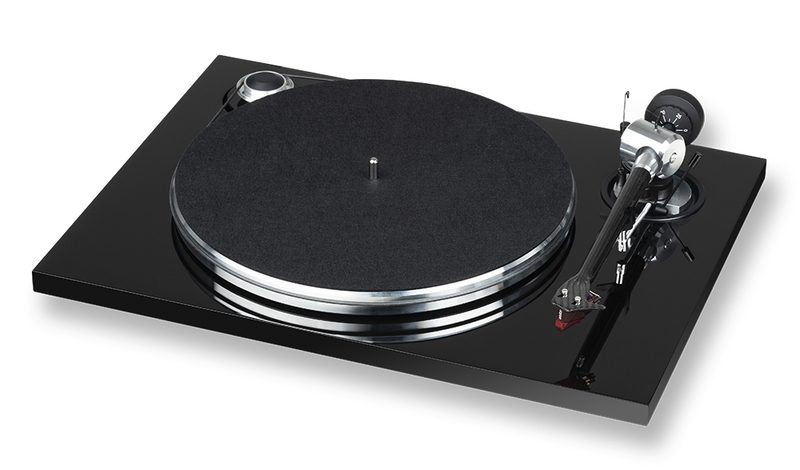 The TURN 5's plinth has a 'heavy-duty' metal construction with shock-absorbing feet and a premium black finish, accented by gold trim. 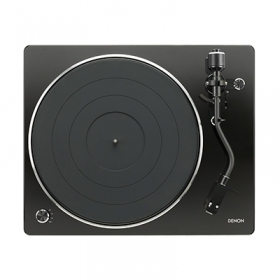 Within the unit, the brushless direct-drive DC motor ensures a quick and powerful drive and consistent rotation. 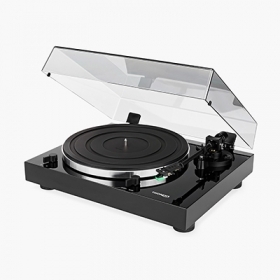 This is directly coupled to the die-cast aluminum platter with dampening rubber base, which helps reducing unwanted resonances. 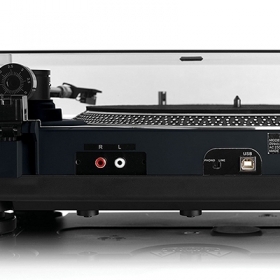 The platter is then topped by a 5mm rubber mat, that further protects against vibrations during playback. 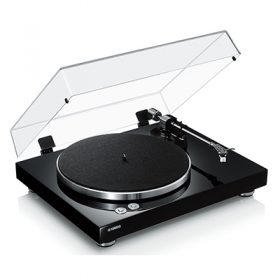 The motor has three speeds (33 1/3, 45 or 78 RPM) that can be selected with convenient buttons on the top of the plinth. 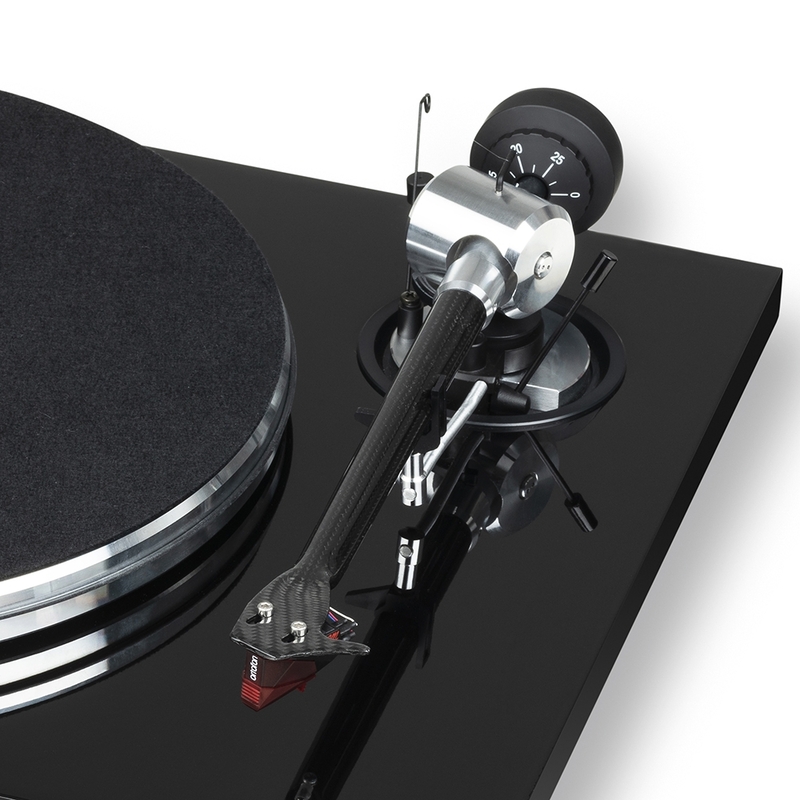 The TURN 5 comes with a static-balanced S-shaped tonearm with anti-skate dial, adjustable VTA, a hydraulic cueing system and a counterweight facilitate a wide variety of cartridge / headshell combinations. 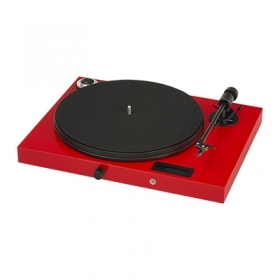 Its removable headshell is pre-mounted with an Ortofon 2M Red cartridge. 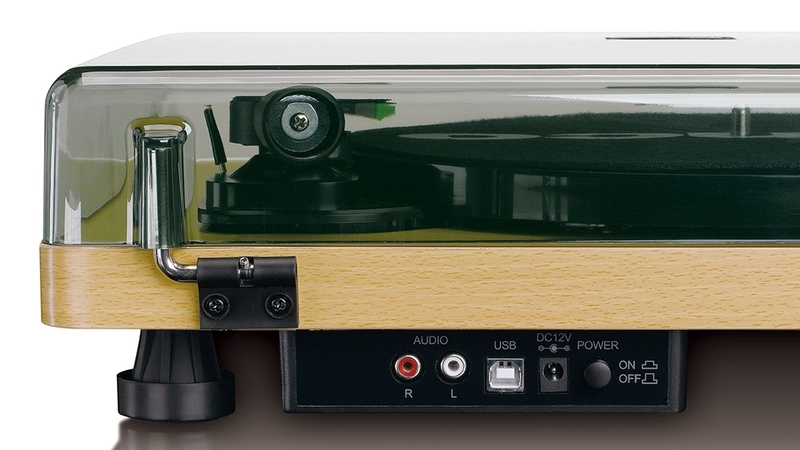 On the rear panel, the turntable has pair of a gold-plated RCA phono outputs and a separate earth connection. 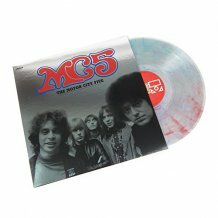 The TURN 5 is supplied with all necessary cables and accessories to get working out of the box, and a dust cover for added protection. 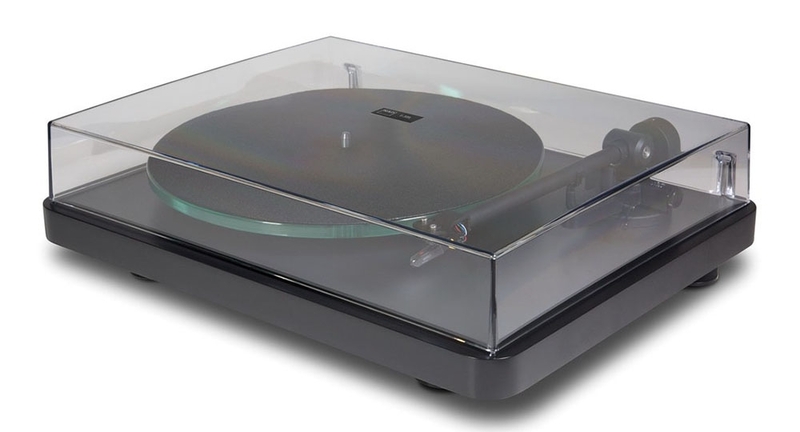 The Juke Box S2 is the second audiophile all-in-one system in Pro-Ject's Juke Box range, and is the upgraded version of the E. The new turntable includes a more sophisticated acrylic platter and a Pick-it 25A Pro-Ject cartridge. 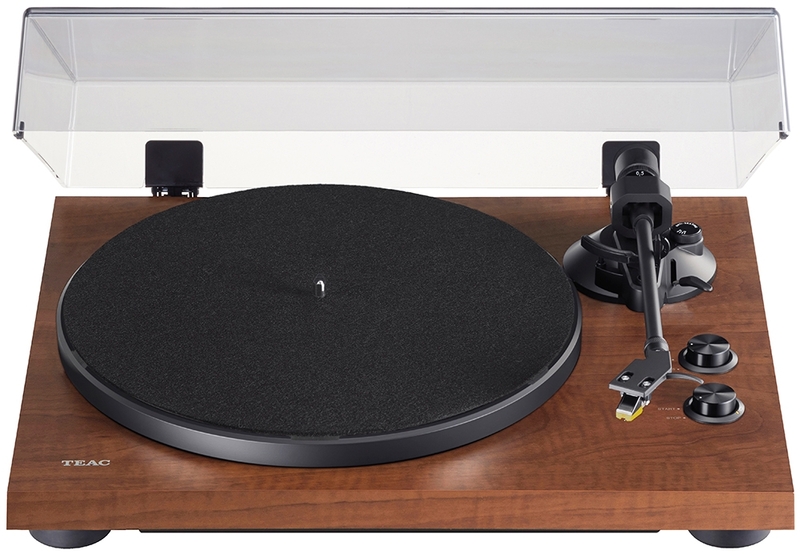 The look of the unit has also been enhanced by adding a beautiful wooden veneer. 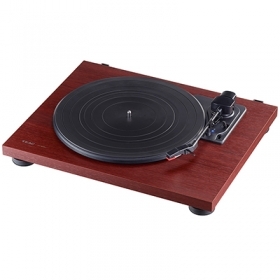 The Juke Box S2 now comes in walnut or eucalyptus finish. 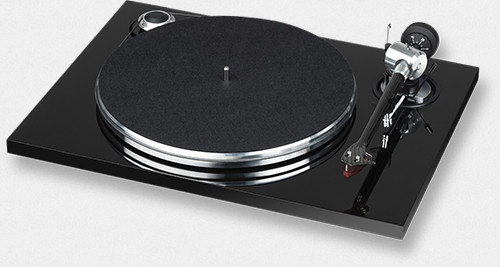 Pro-Ject also added an extra variable line out to the back of the unit. 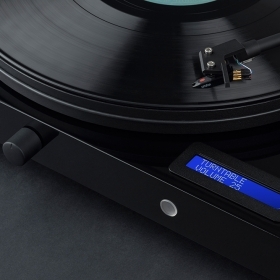 Acclaimed for true high-end turntables, Austrian company European Audio Team recently released the most affordable turntable in the EAT lineup, the Prelude. 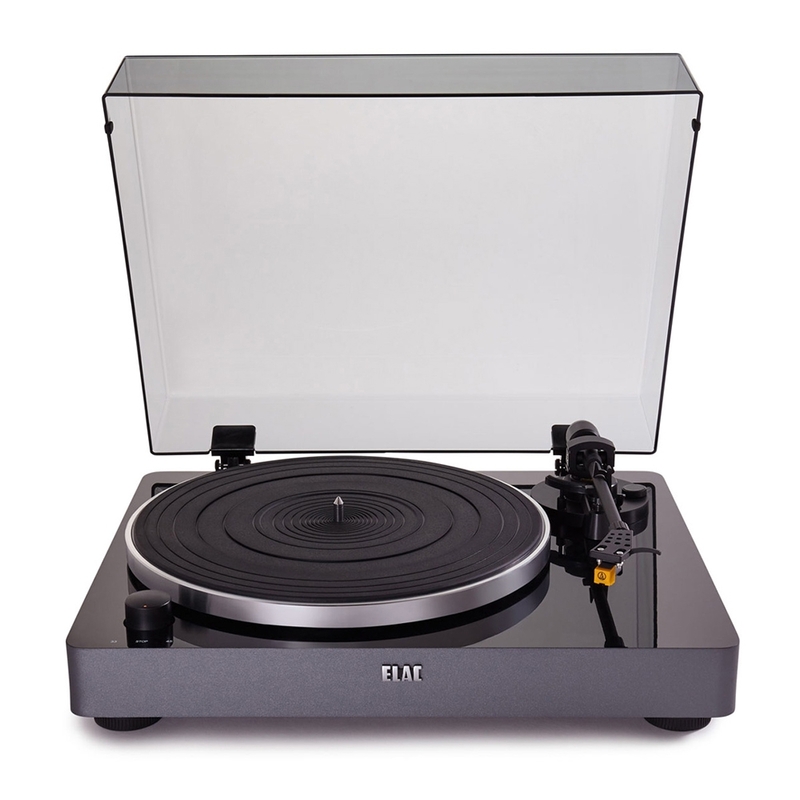 With the considerable use of mass, EAT has waged a war on unwanted vibration, resonance and coloration of the sound. 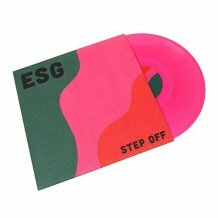 Now for the first time they offer a deck which is affordable, but also able to provide neutral sound. 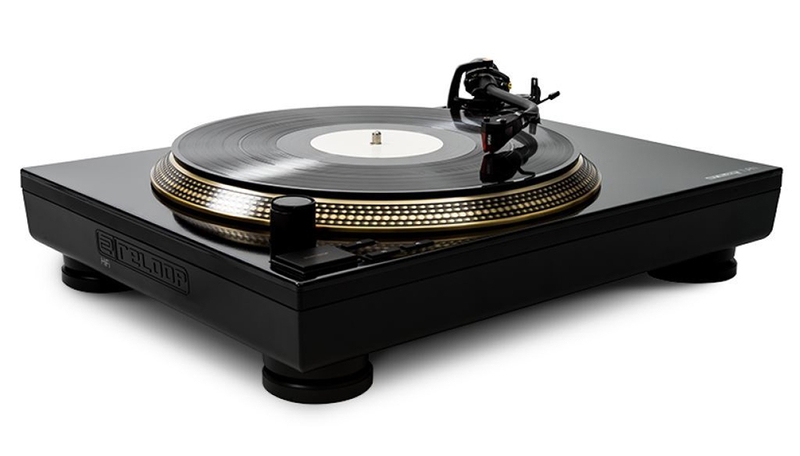 The Prelude uses a heavyweight solid aluminum platter together with a low-tolerance (0.01) polished stainless steel spindle in a soft bronze bushing to ensure a super silent and smooth movement. 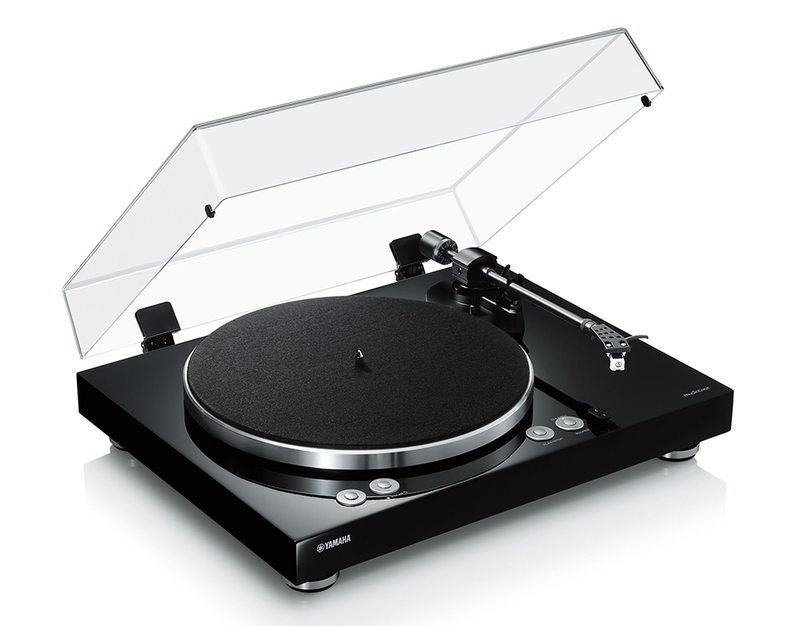 This is the same base material as in they high-end models. 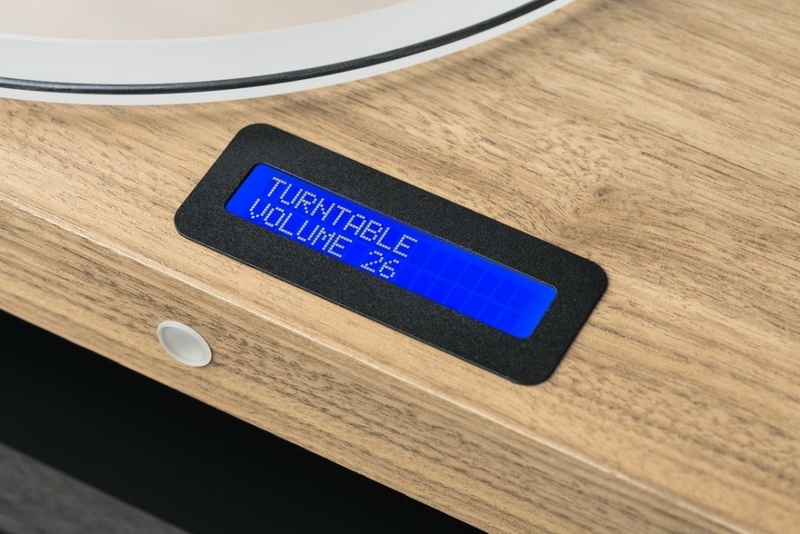 The plinth is made out of MDF, protected by eight layers of piano lacquer which produce an elegant look and finish, without using a glued-on veneer. 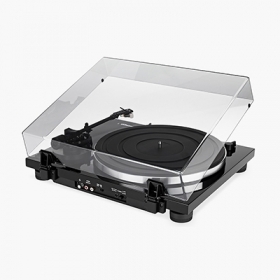 The turntable is driven by a free-standing 100% isolated motor with no connection to the plinth, a precision diamond-cut pulley, and a high damping, precision-cut drive belt. 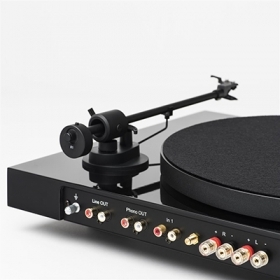 To accommodate the included Ortofon 2M Red cartridge, the turntable comes with a newly developed 9" A-Note tonearm, designed specifically for moving-magnet cartridges. 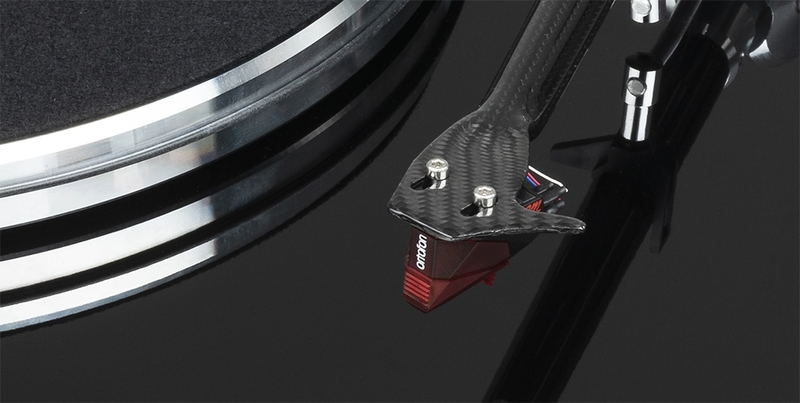 It's a lightweight, ultra-stiff and resonance-free carbon tonearm tube, which is fabricated as a single piece. 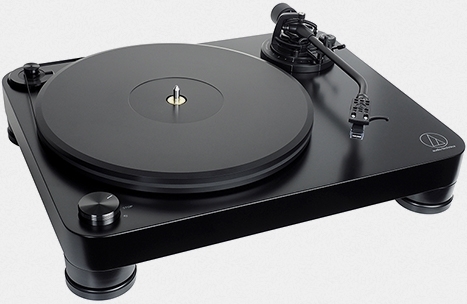 Unusual for this price range is the bearing block for the tonearm and the counterweight. 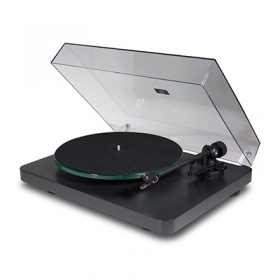 The mass bearing block acts as an energy sink for all resonances from the cartridge as well as low frequencies from the plinth. 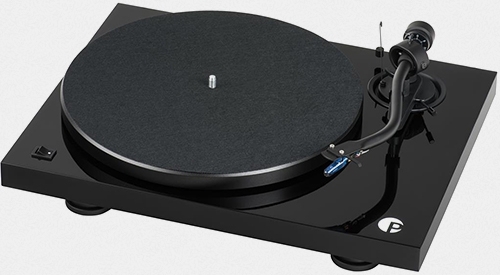 The counterweight implements an anti-resonator damper to reduce the amplitude of the natural tonearm/cartridge resonance. 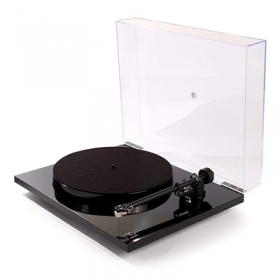 A hinged acrylic dustcover and DC power supply is also included. 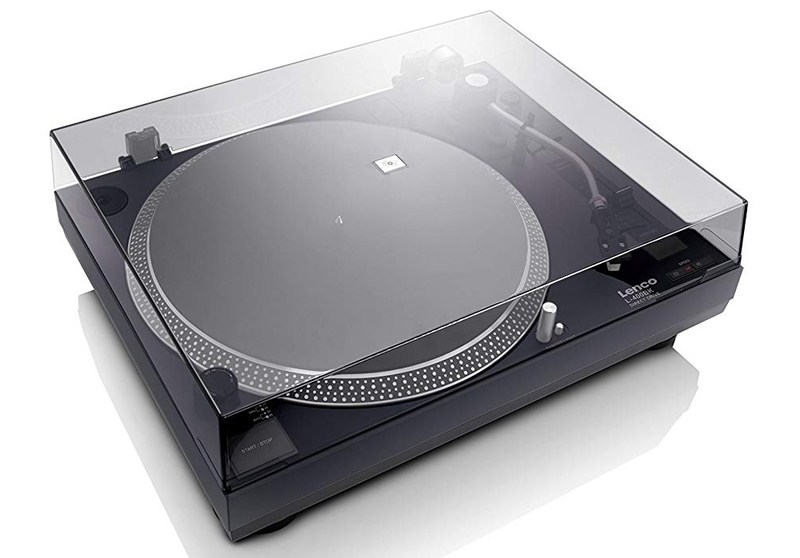 The CS 526 is the German Dual company's new semi-automatic turntable with electronic stop function. 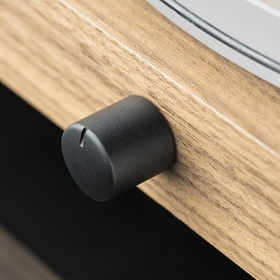 This means that at the end of the record, the arm is automatically raised so that the stylus is not overstressed in the outlet groove. 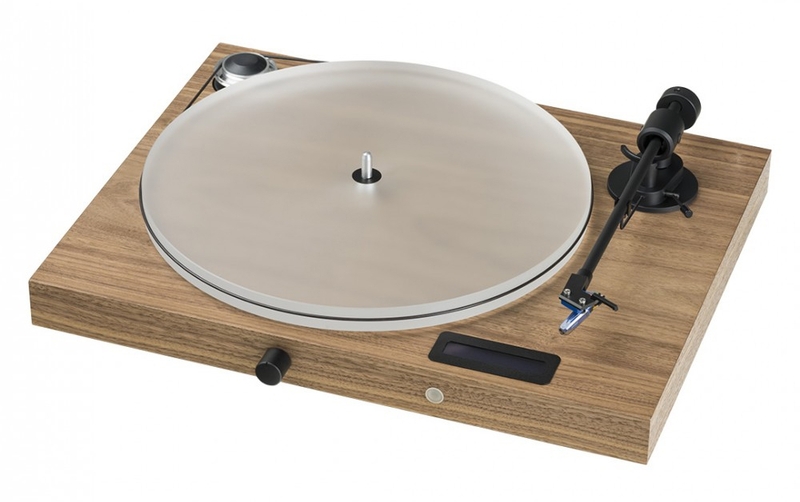 The turntable itself combines the 28mm thick massive wooden chassis, motor unit and bearing used in the Dual CS-550 with the tonearm from the Dual CS 505-4, into a new sleek design with exceptional performance. 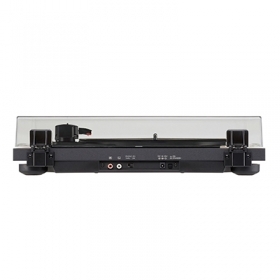 Its heavy aluminum sandwich platter with additional damping ring is driven by a precision ground flat belt, hidden under the turntable, and a DC motor with electronic speed control. 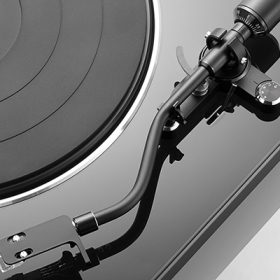 The tonearm uses a cardan bearing with zero-mass tracking force setting thanks to high-precision torsion spring. 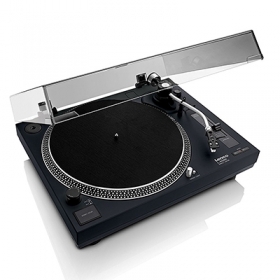 It is equipped with a viscous arm lift and the anti-skate can be adjusted via a dial at the base of the arm. 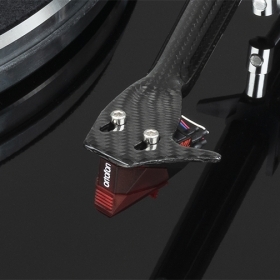 The tonearm is paired with a removable headshell made of carbon-fiber composite and an Ortofon OM 10 cartridge.